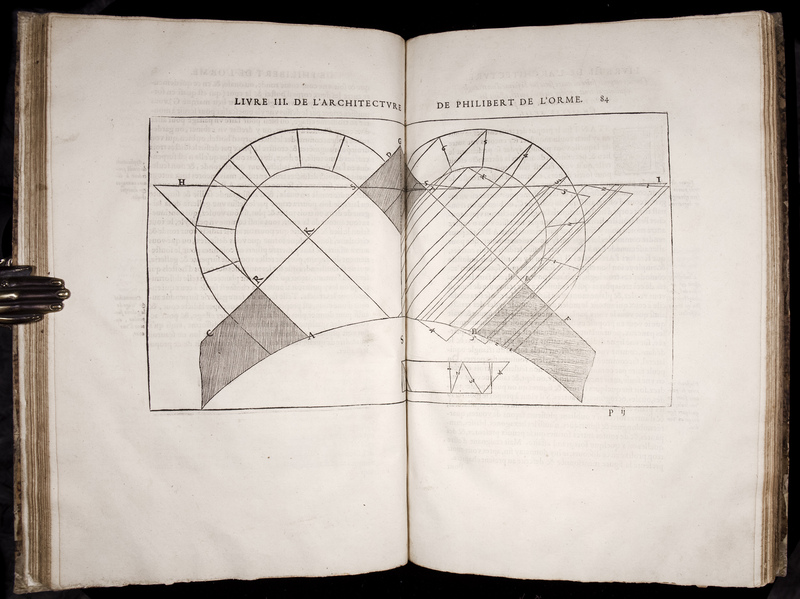 Le Premier Tome de l'Architecture. 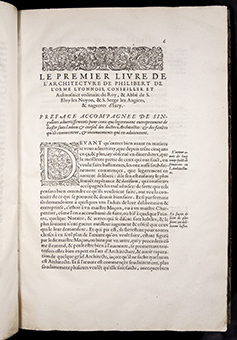 Text in French; illustrated with 205 fine large woodcut illustrations, including 74 full-page and 7 double-page blocks, and a magnificent woodcut title-border. 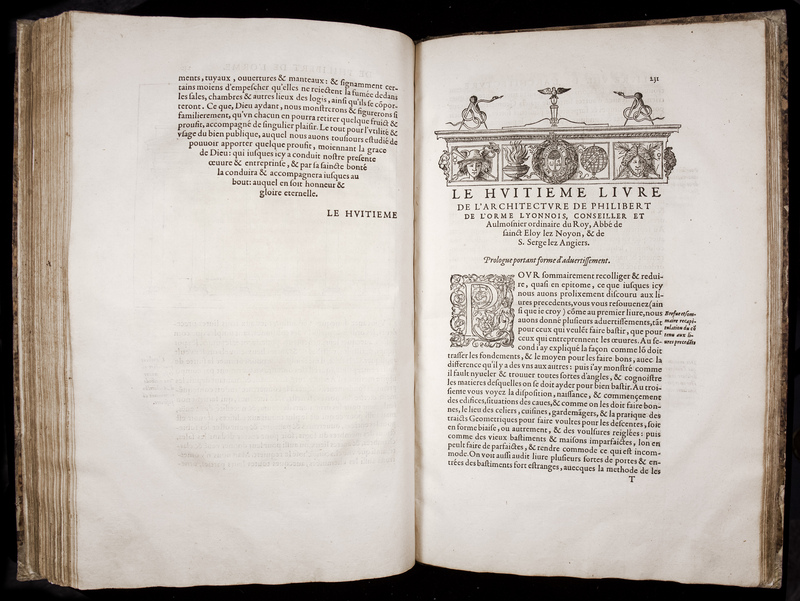 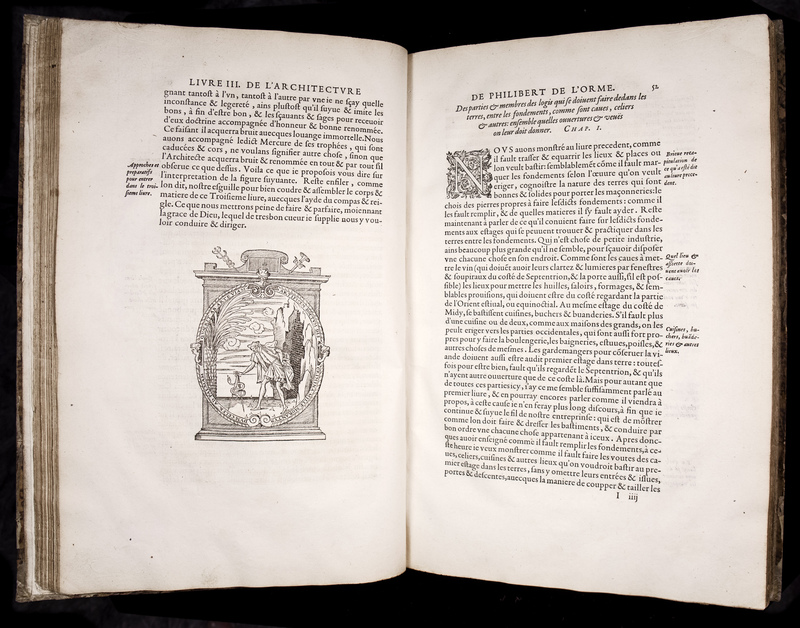 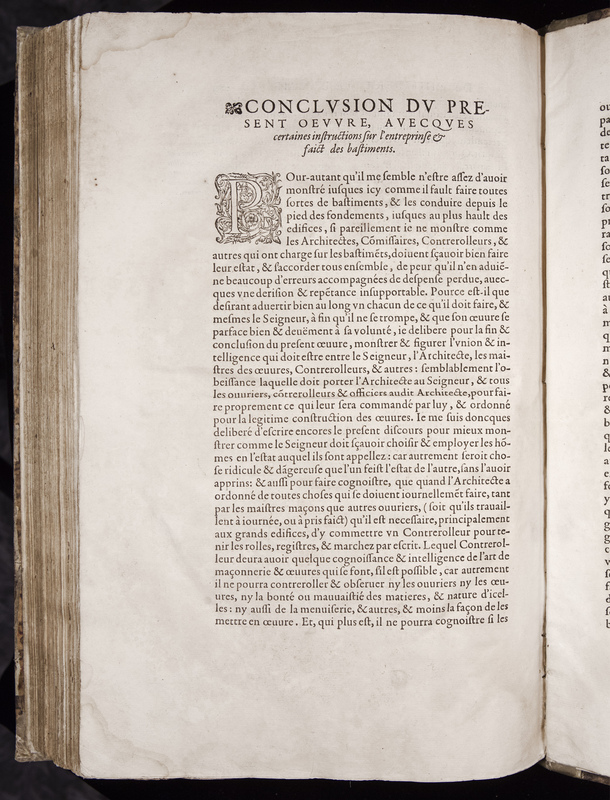 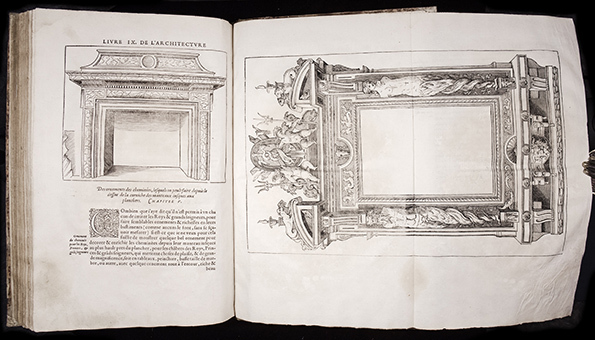 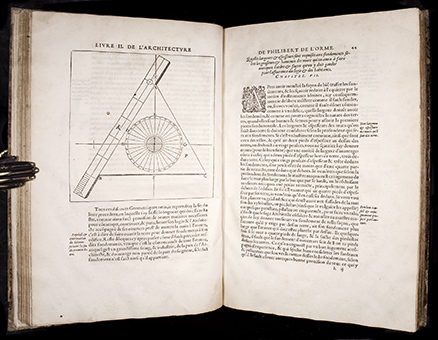 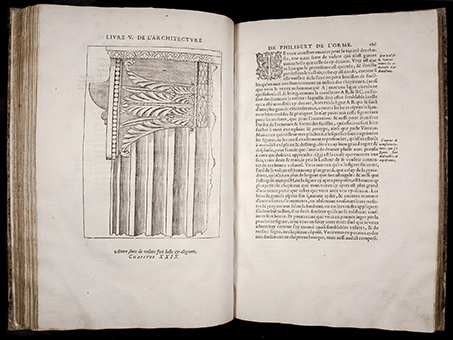 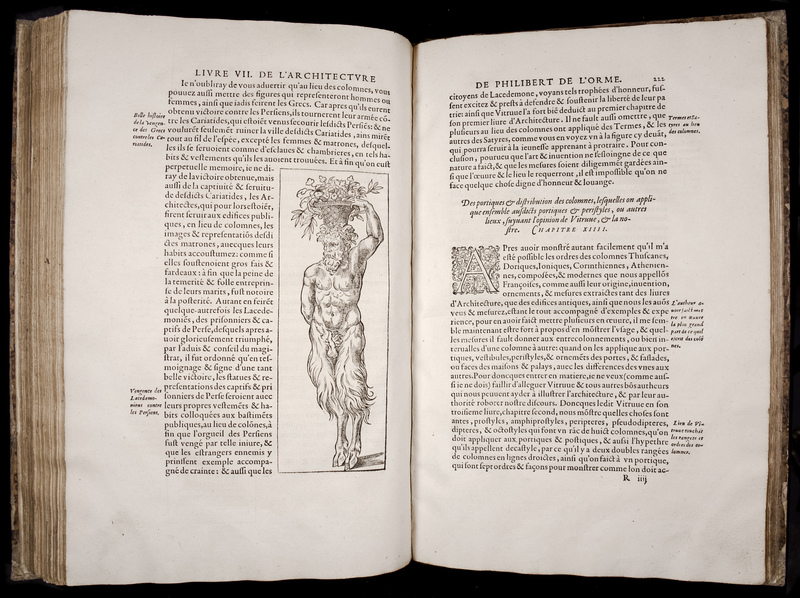 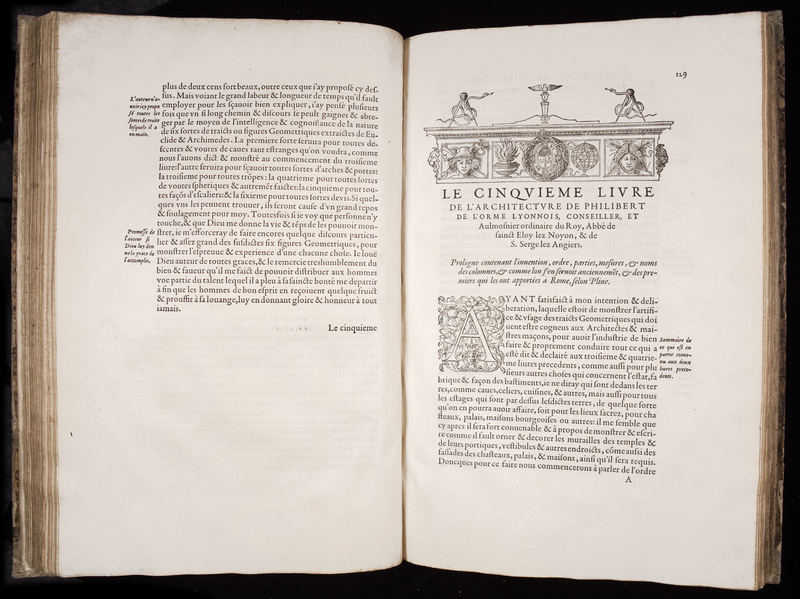 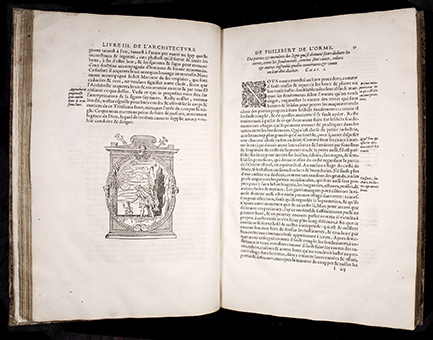 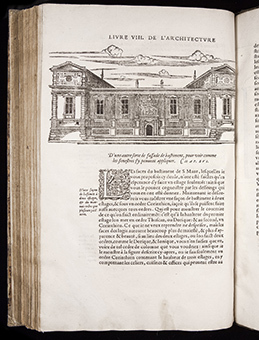 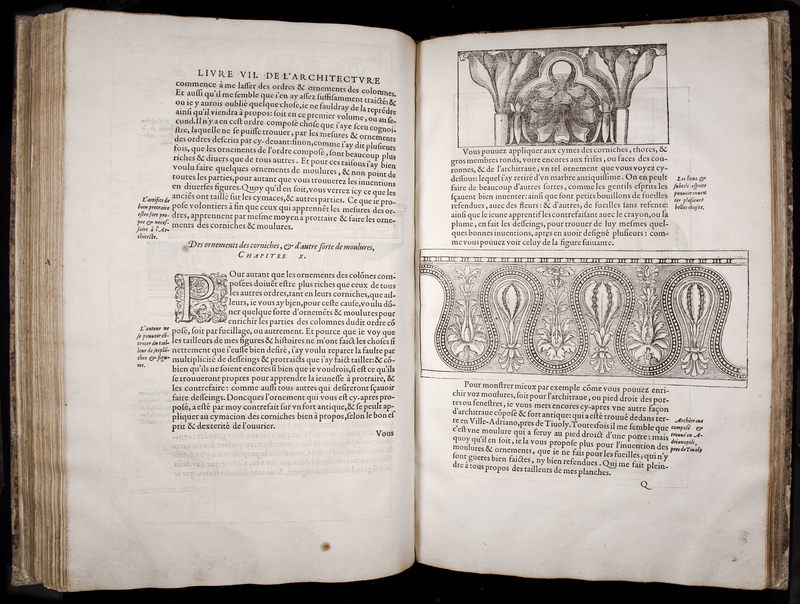 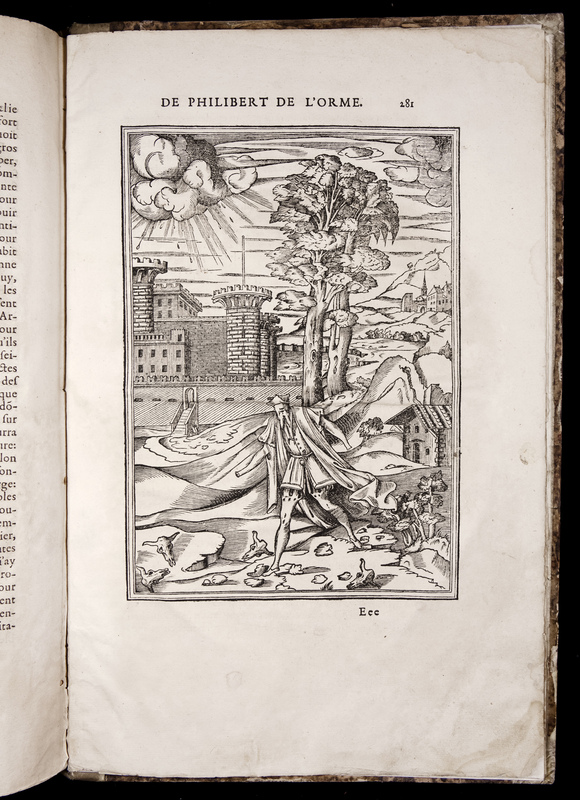 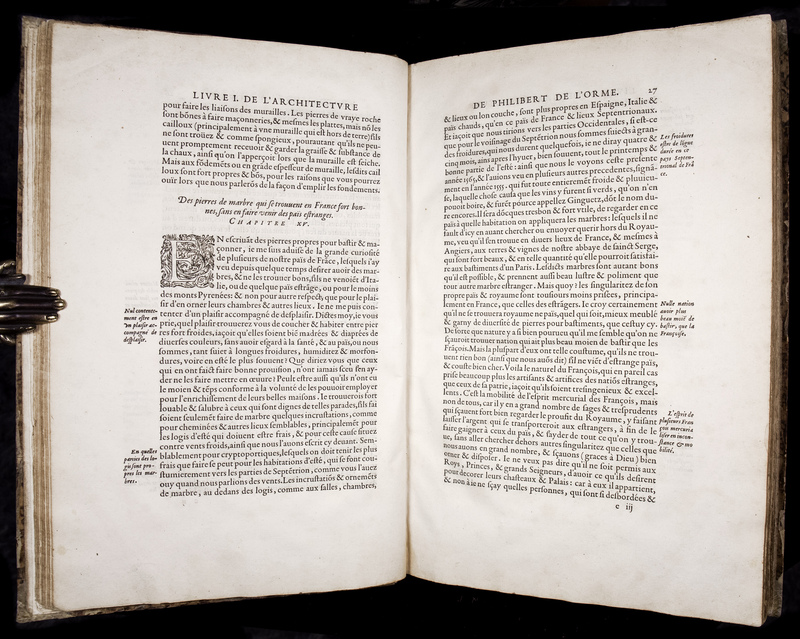 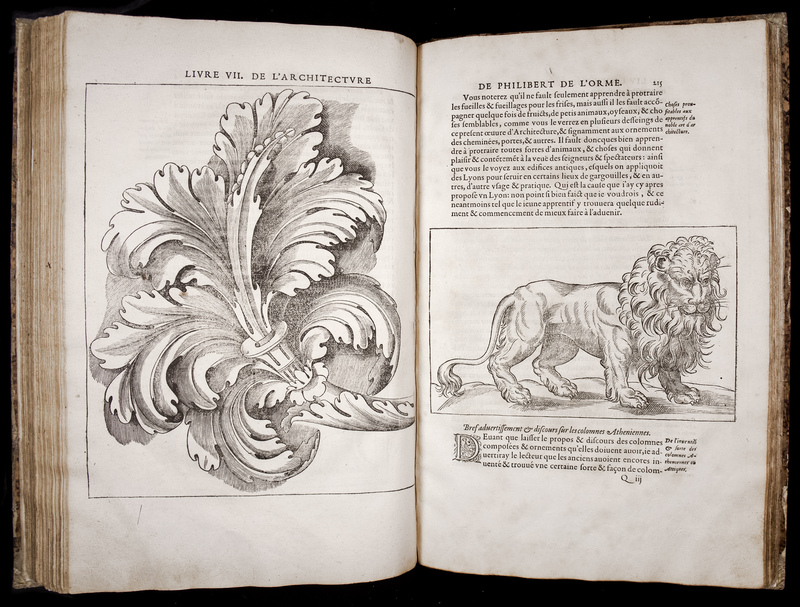 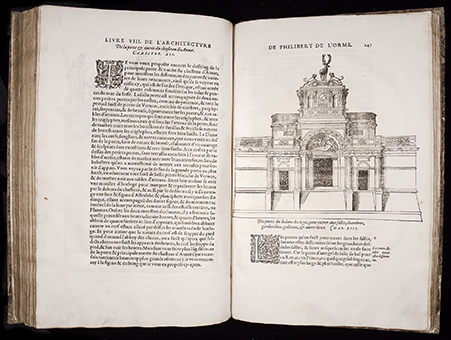 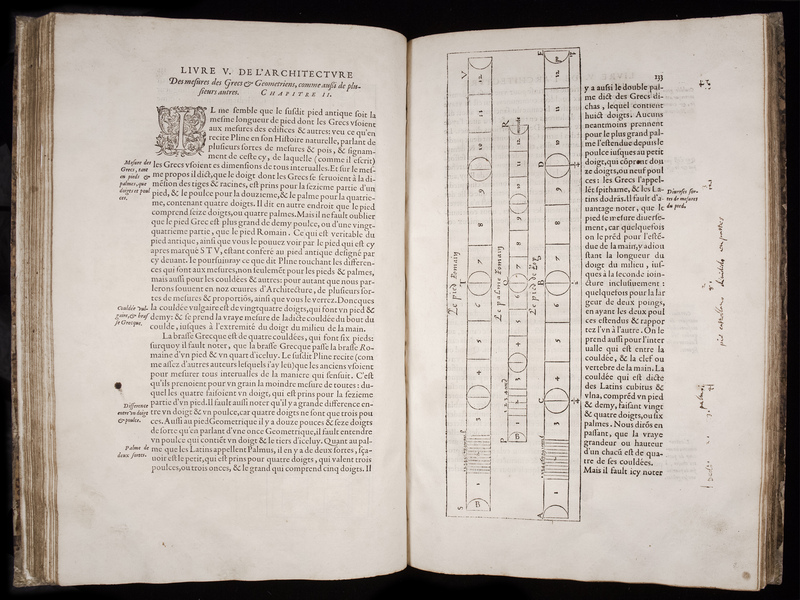 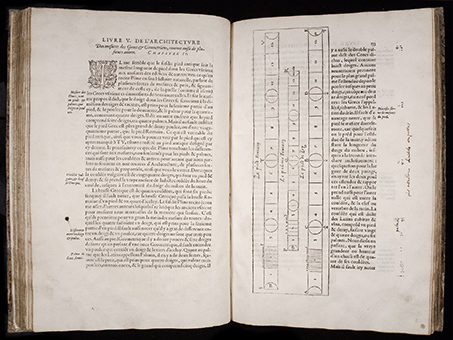 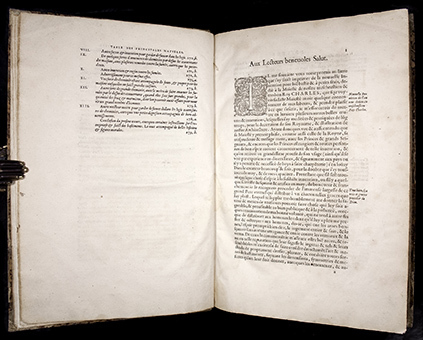 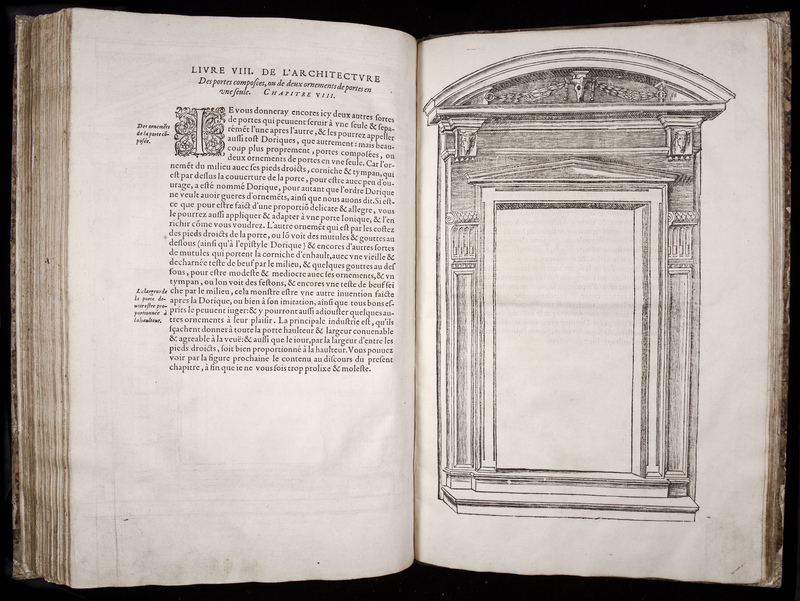 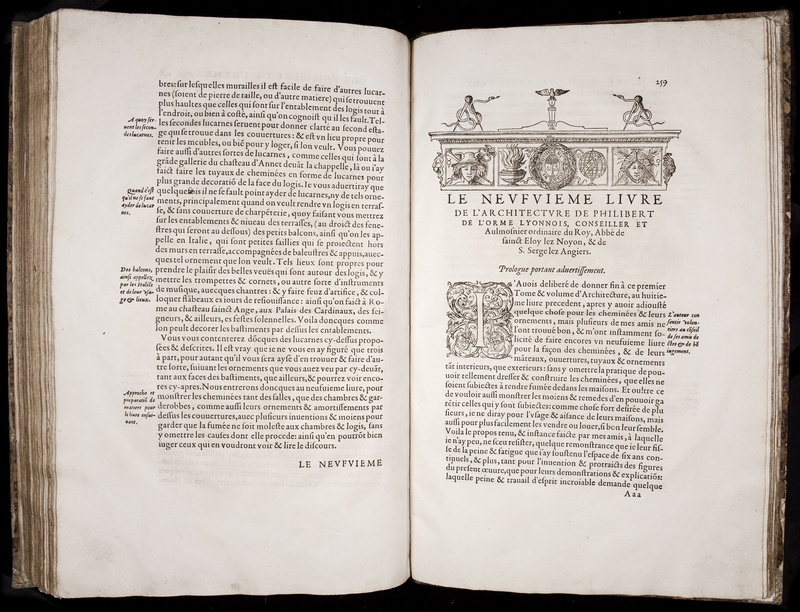 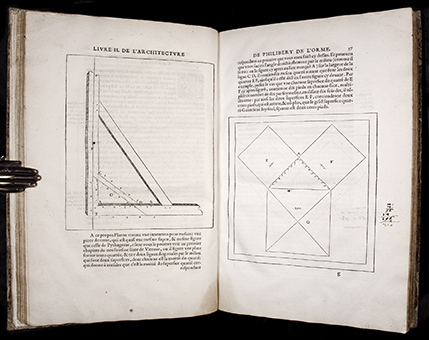 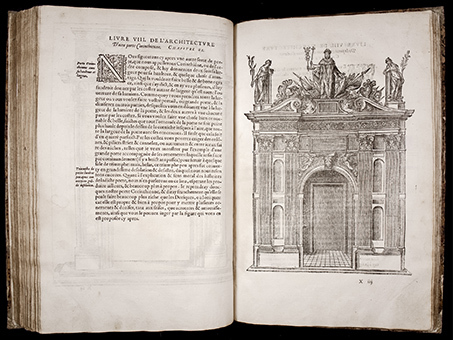 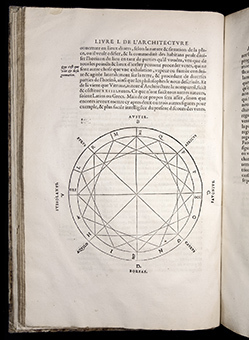 FIRST EDITION, FIRST ISSUE, dated 1567 on title; the example offered here is very large (39 x 24½cm) and with the two additional unnumbered leaves at the end (present in very few copies). 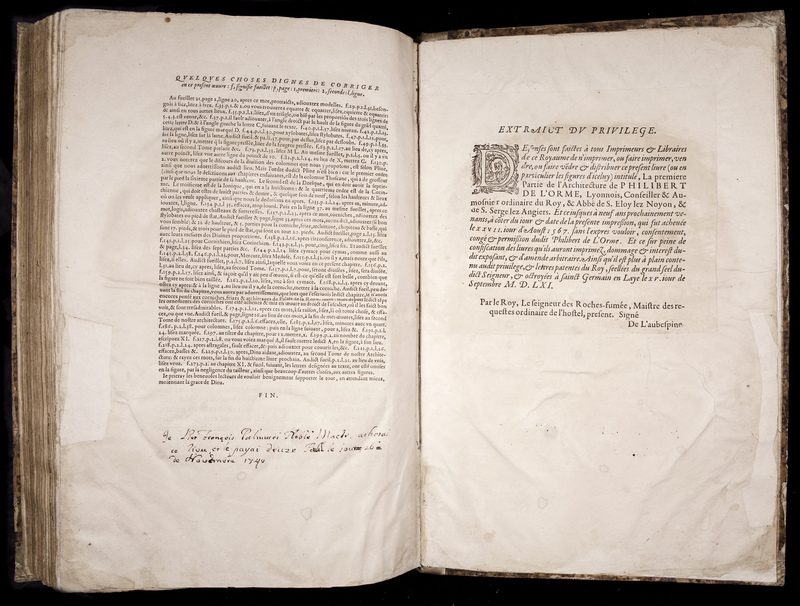 RARE THUS! 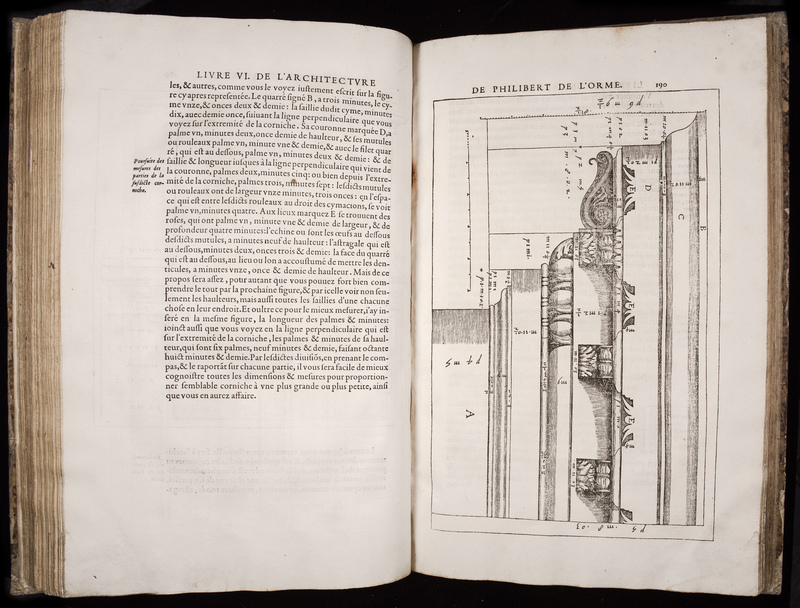 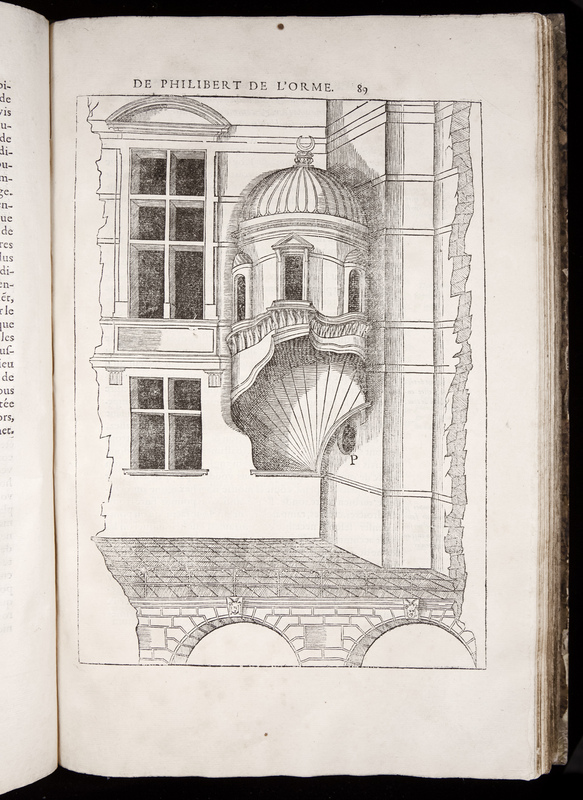 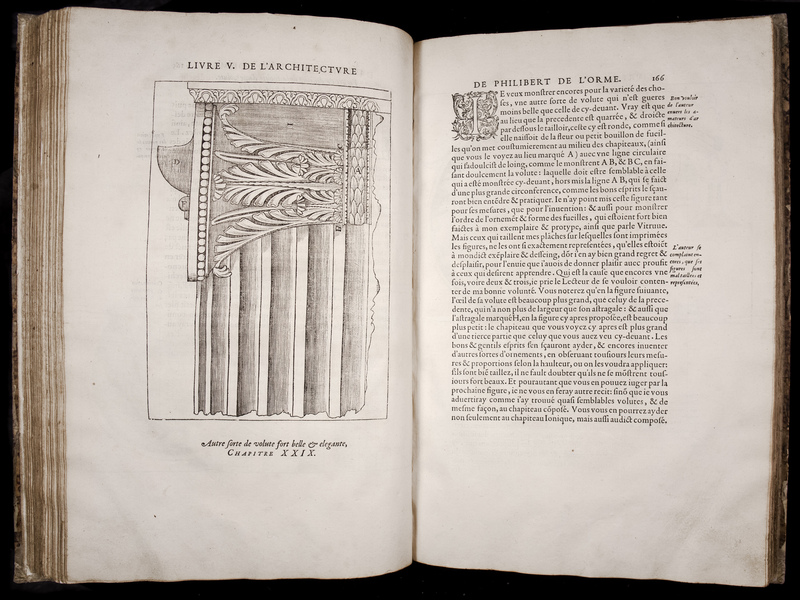 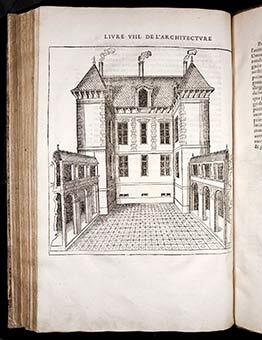 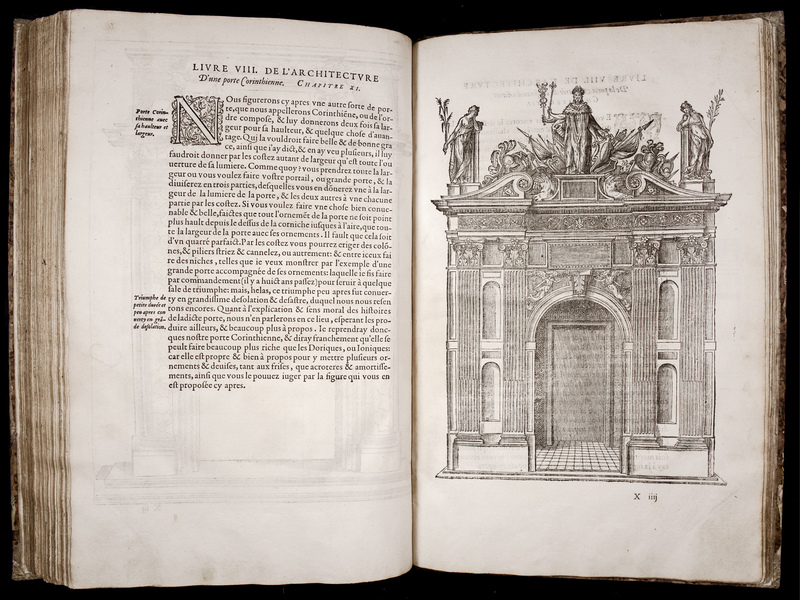 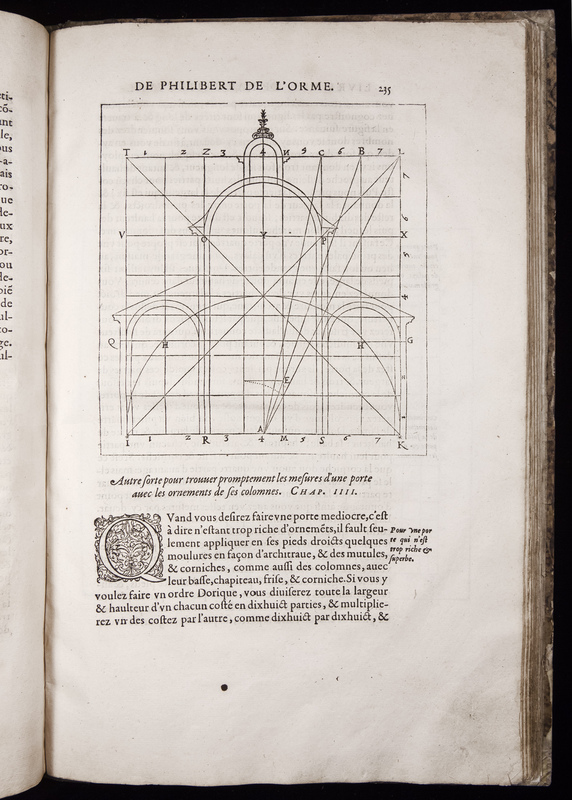 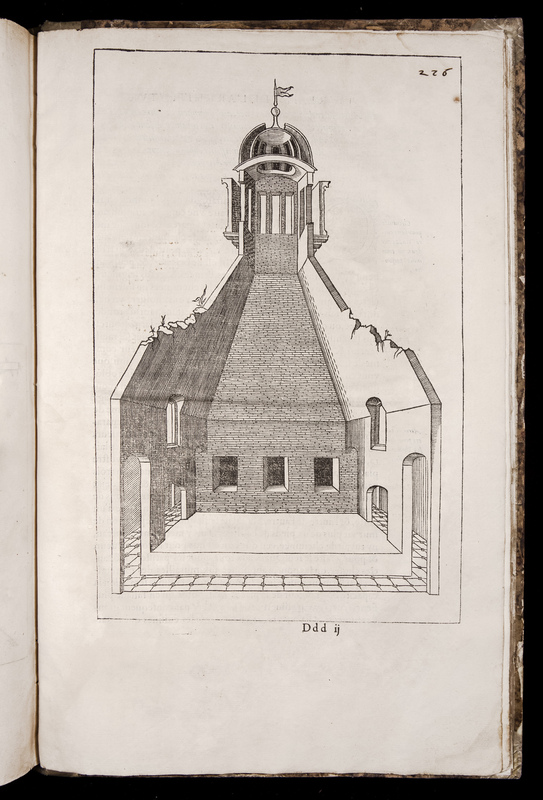 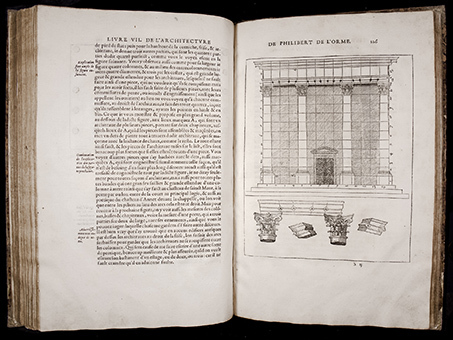 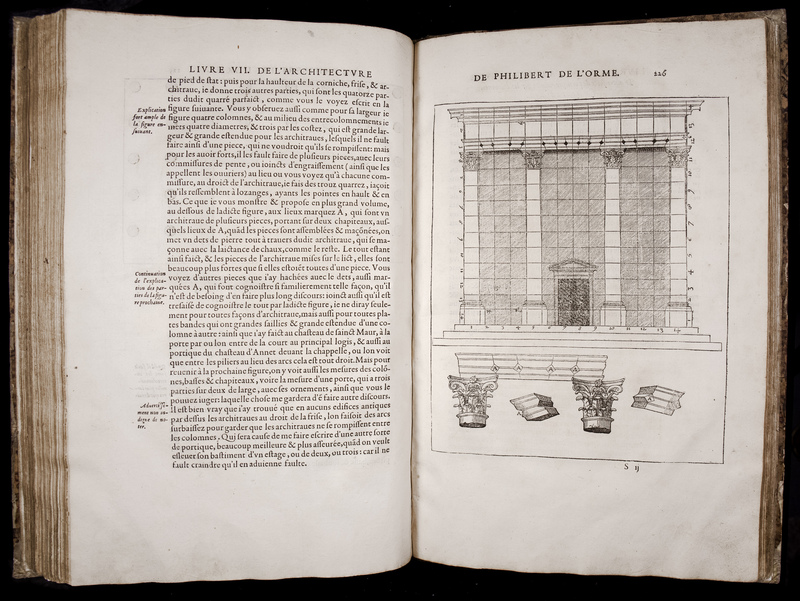 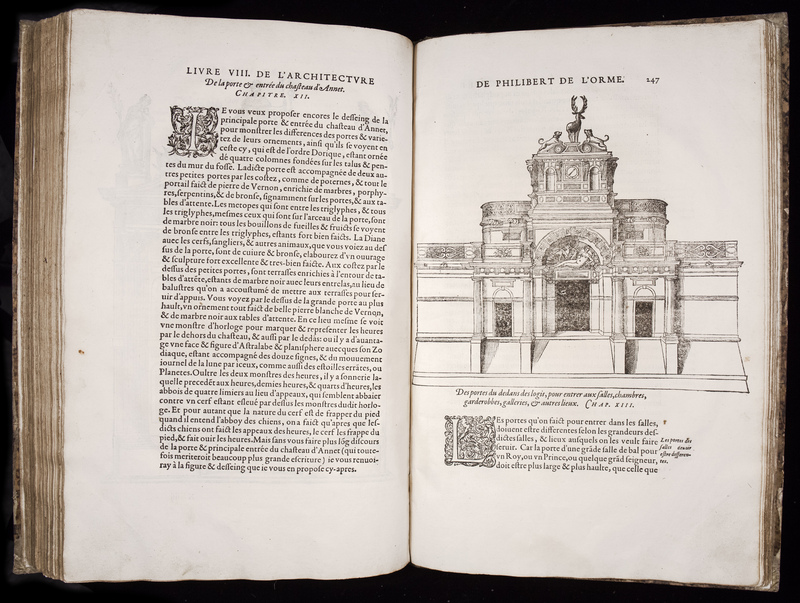 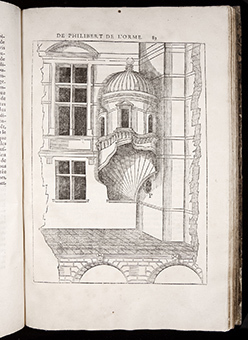 The first and only published volume of a projected monumental encyclopedia of architecture, De l'Orme's Le premier tome de l'architecture is, arguably, the most influential and most lavishly illustrated handbook of French Renaissance architecture! 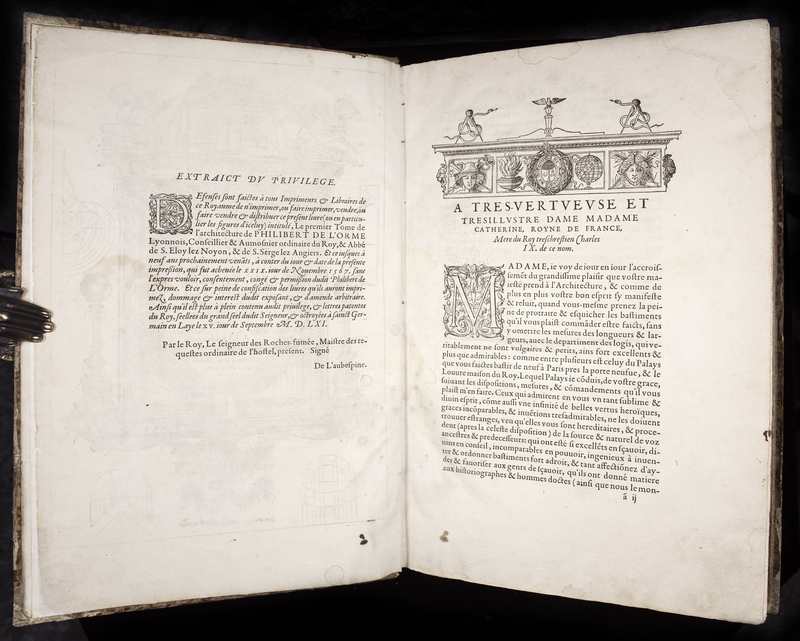 A second volume was planned by the author but never completed. 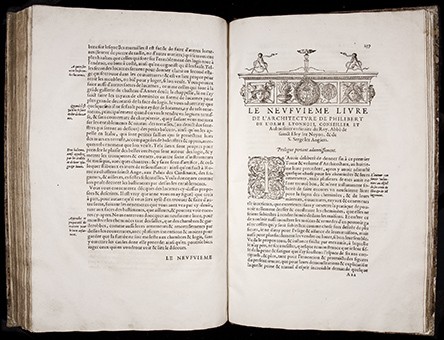 Dumoulin cites this edition of De l'Orme as the finest work printed by Morel's press (see Joseph Dumoulin, Vie et oeuvres de Frédéric Morel, p.41-4). 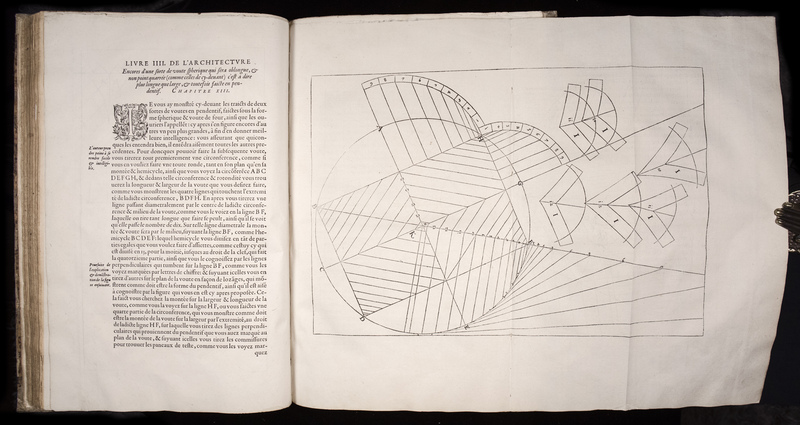 The work consists of nine books which deal with construction as a whole. 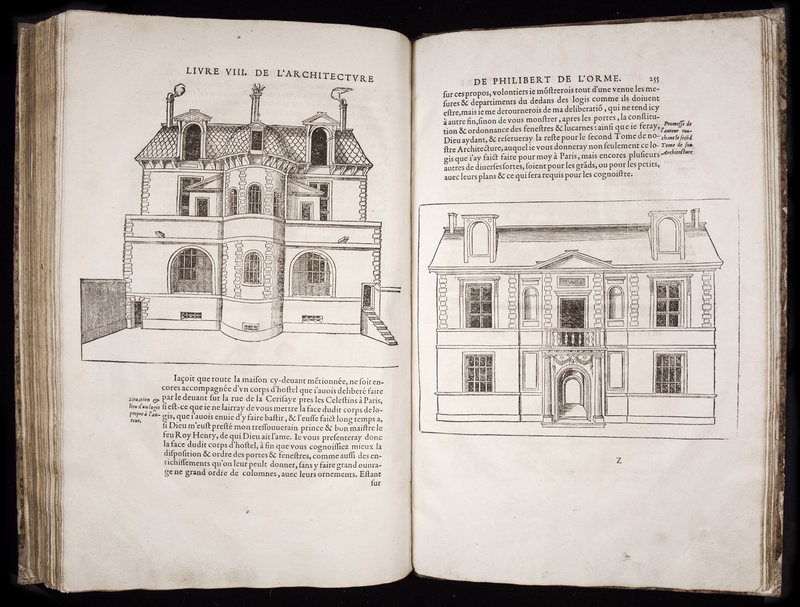 The first two books contain preliminary considerations relative to general building conditions (choice of the site, orientation, choice of materials, etc.) 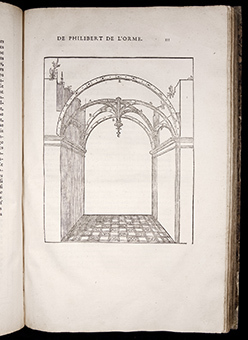 as well as the status of the architect. 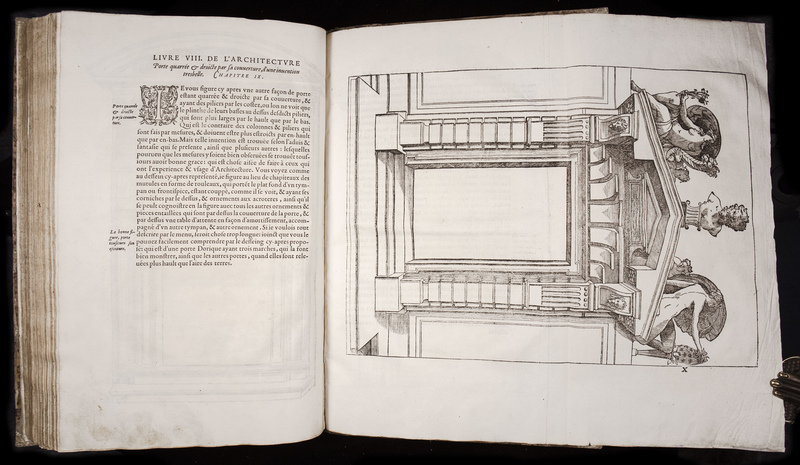 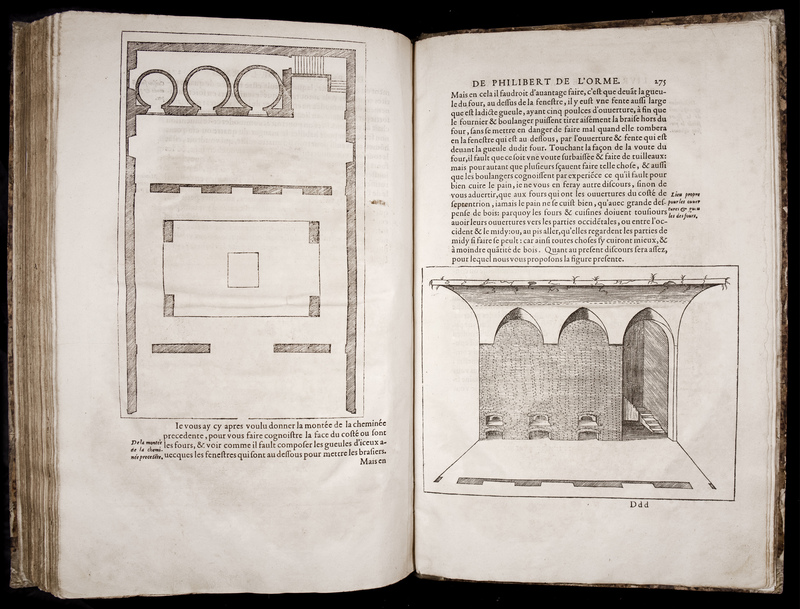 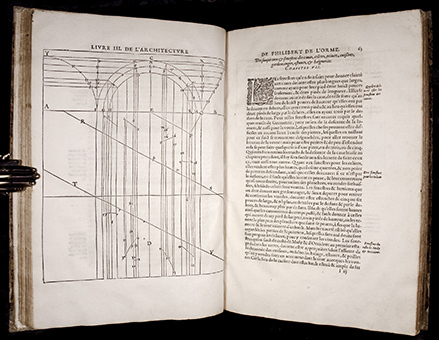 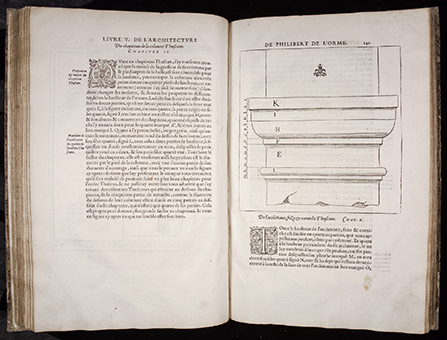 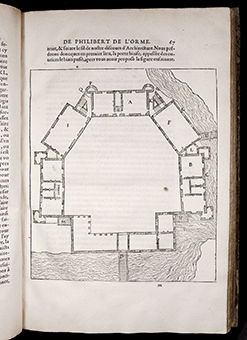 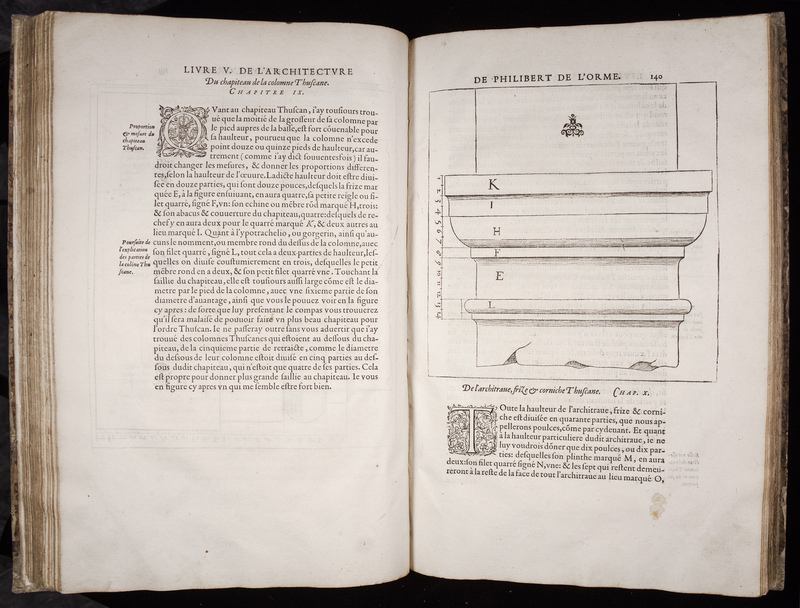 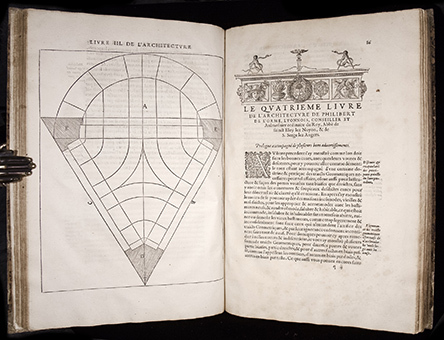 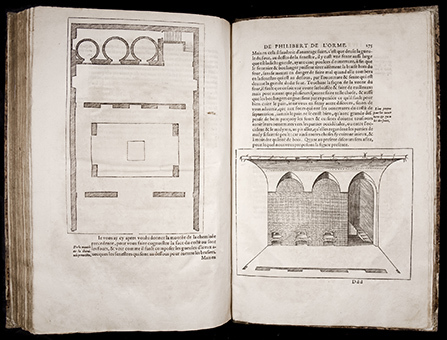 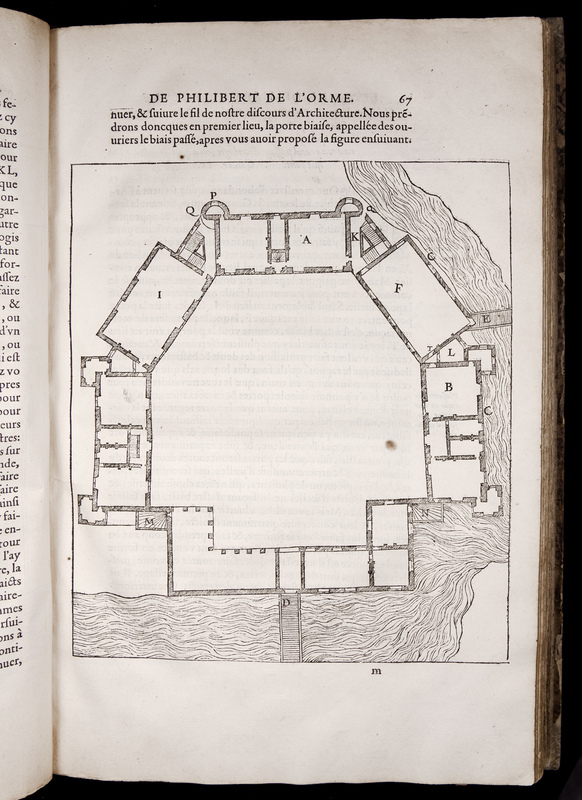 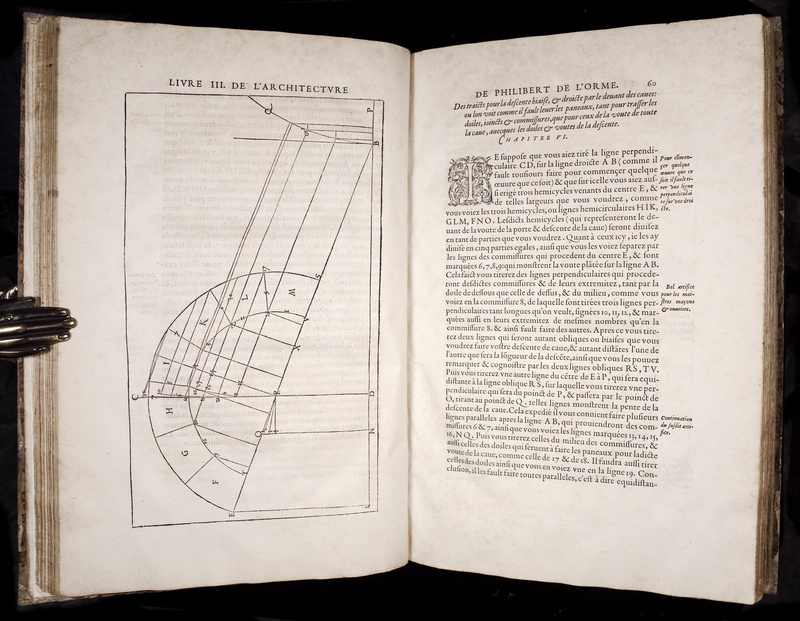 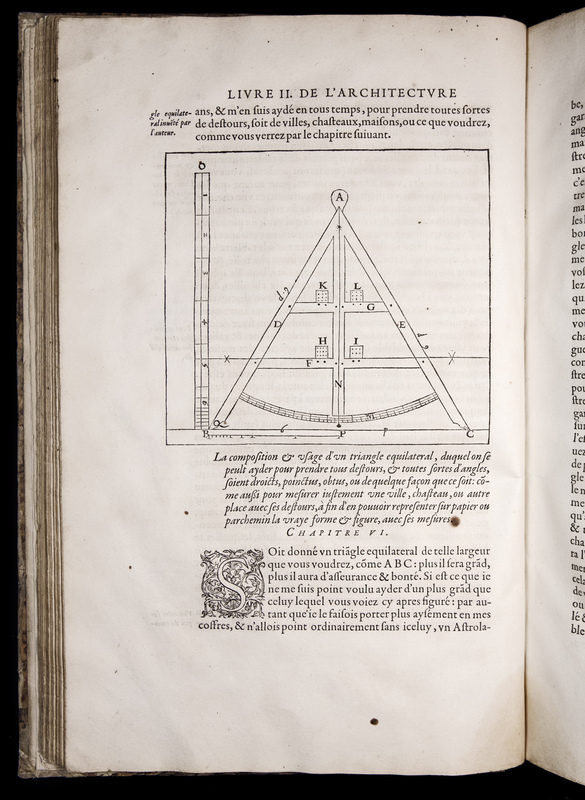 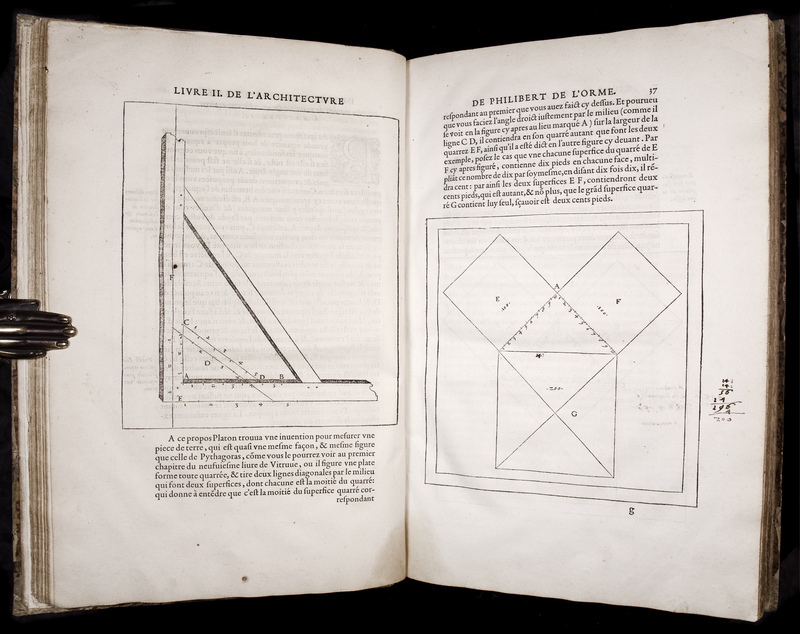 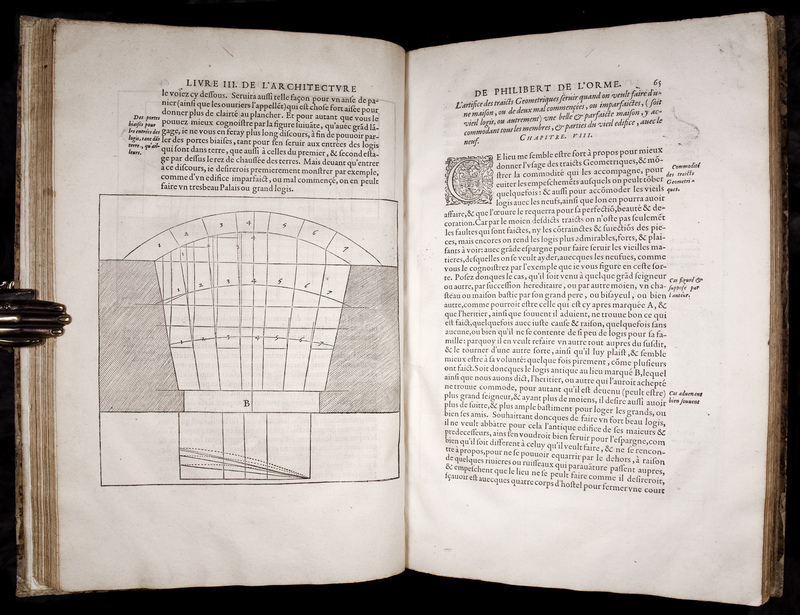 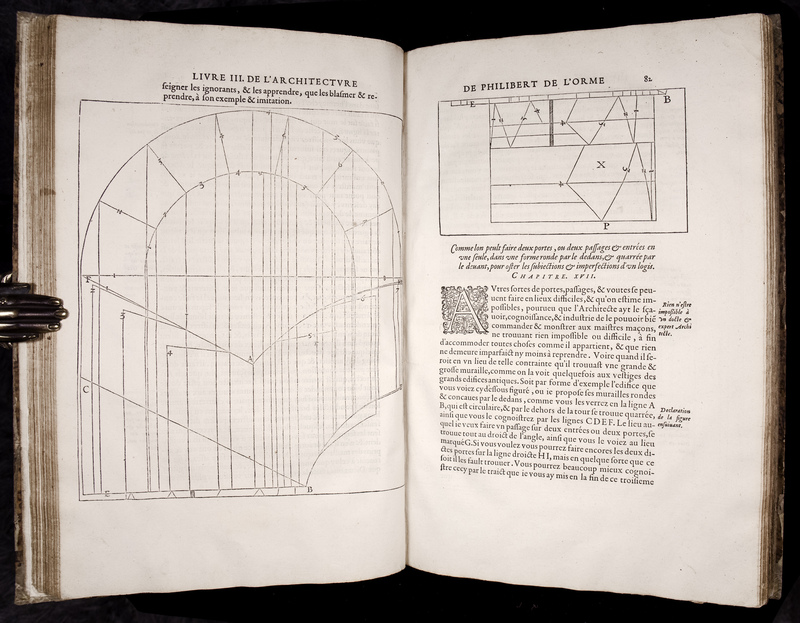 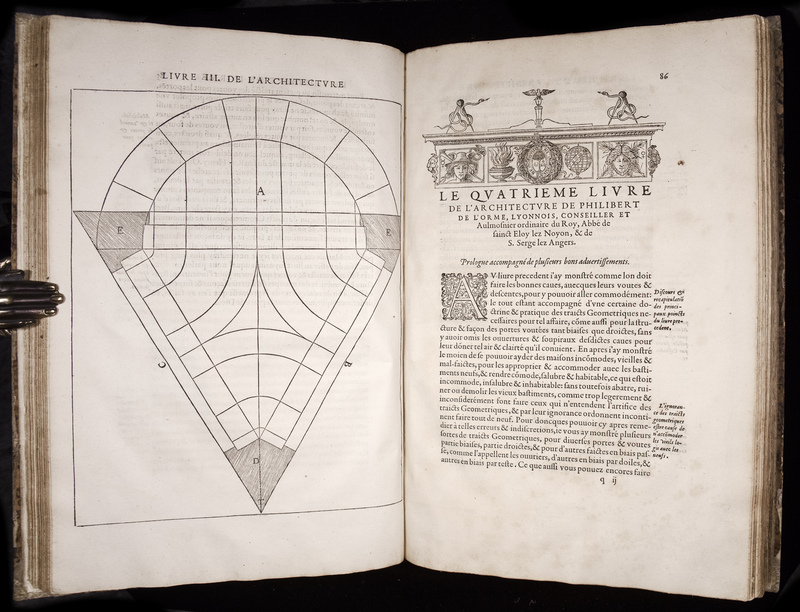 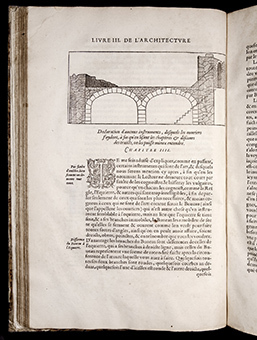 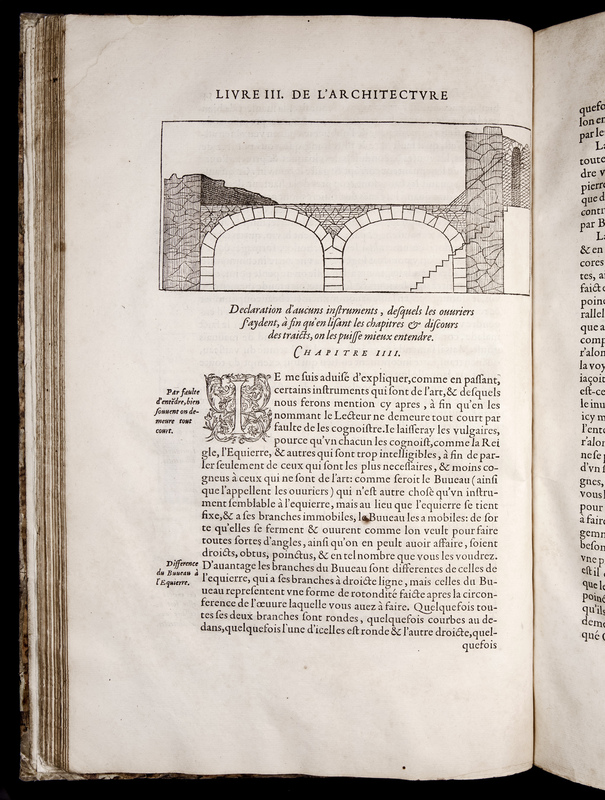 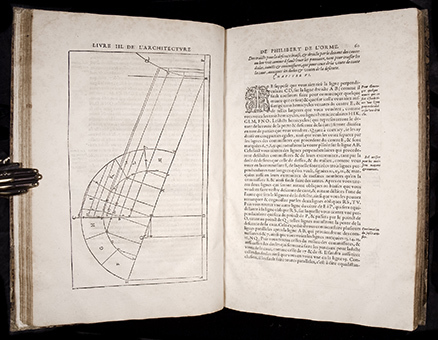 Books III and IV treat the basics of the edifice : foundations, cellars, and more generally stone structures which guarantee stability and functionality, in particular the vaults, squinches and staircases. 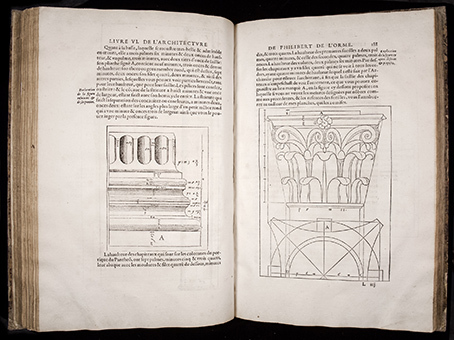 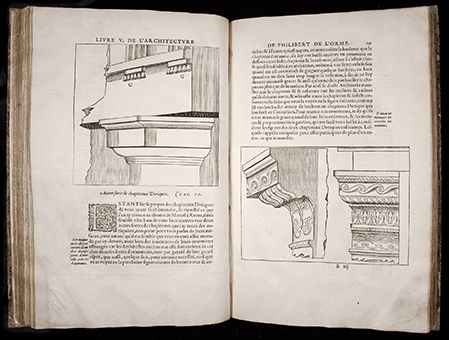 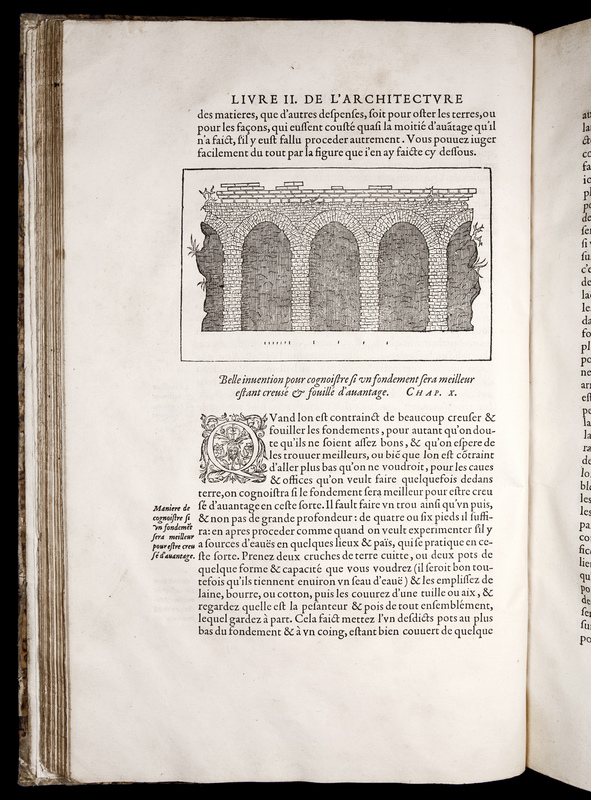 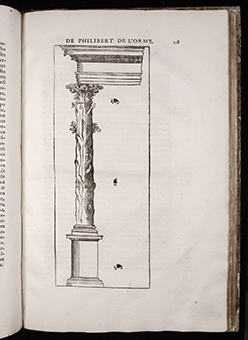 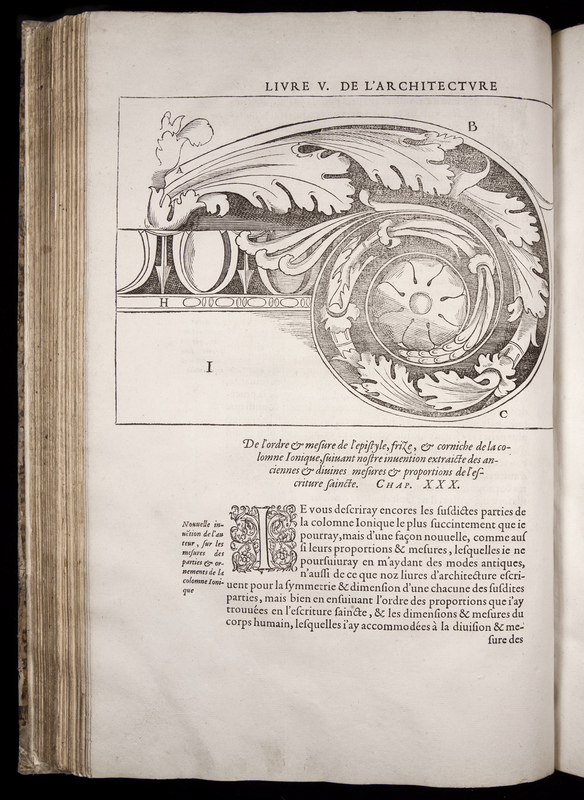 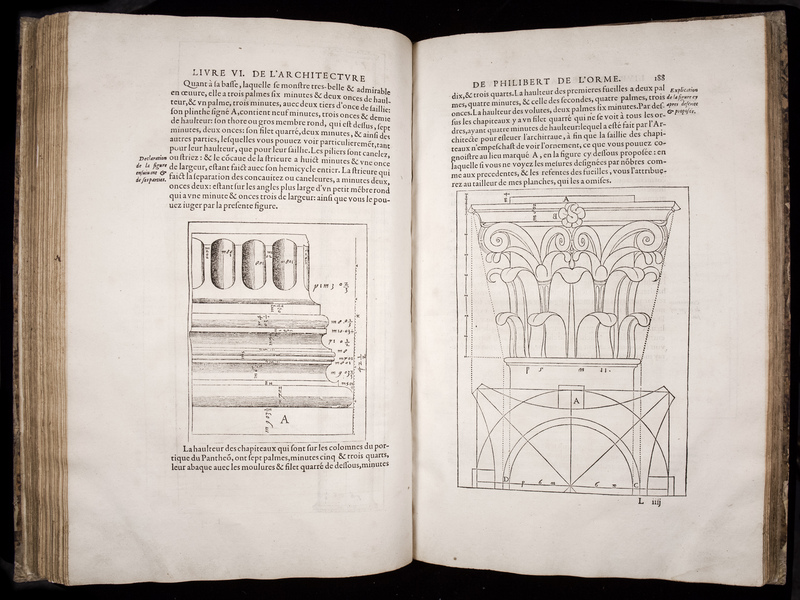 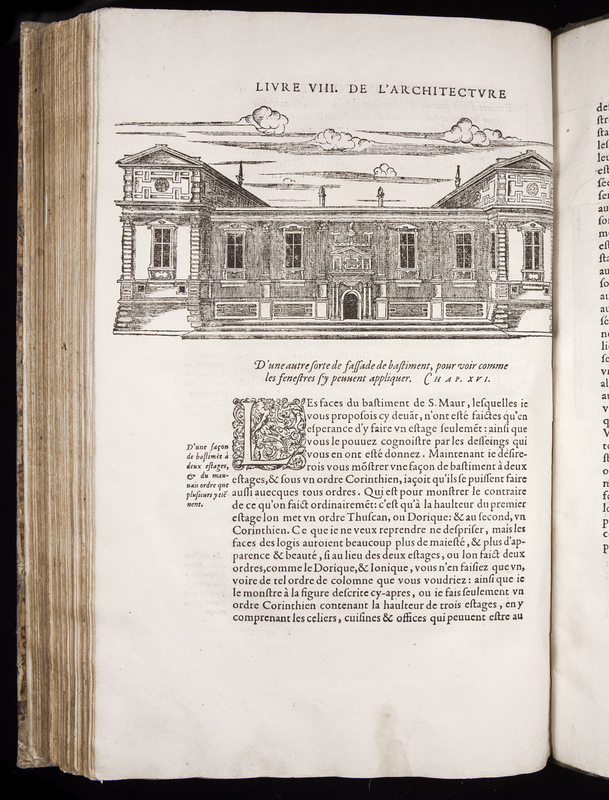 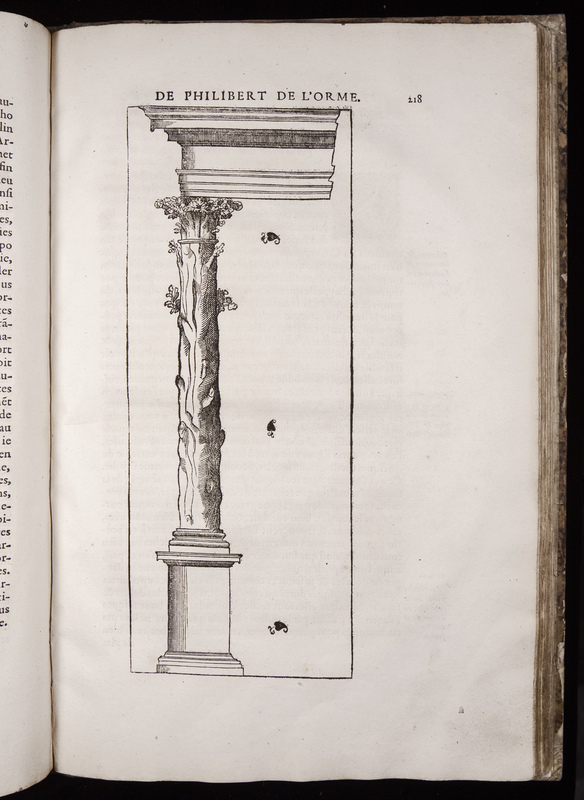 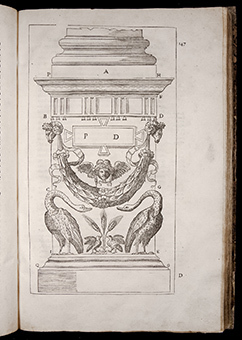 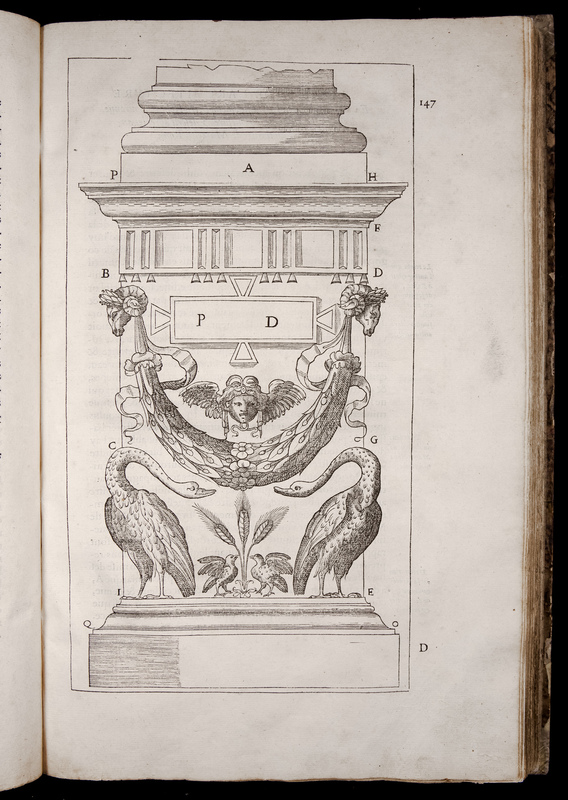 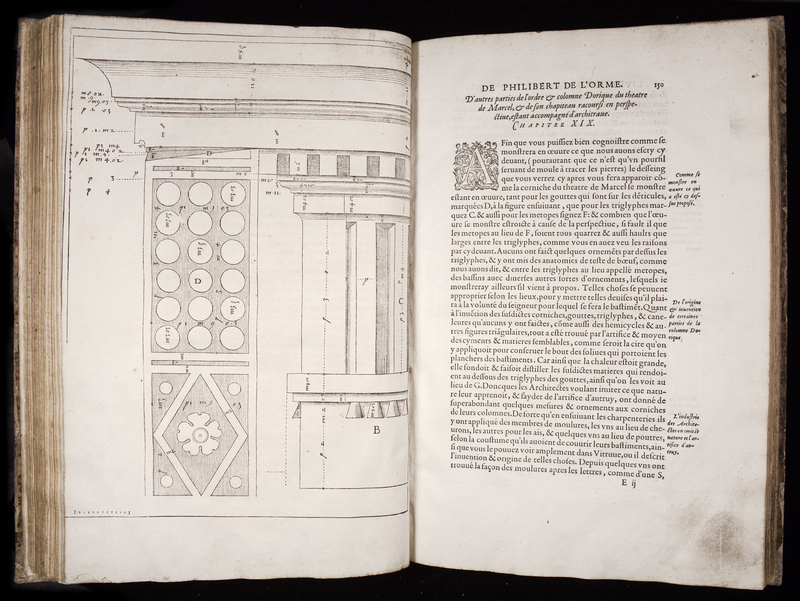 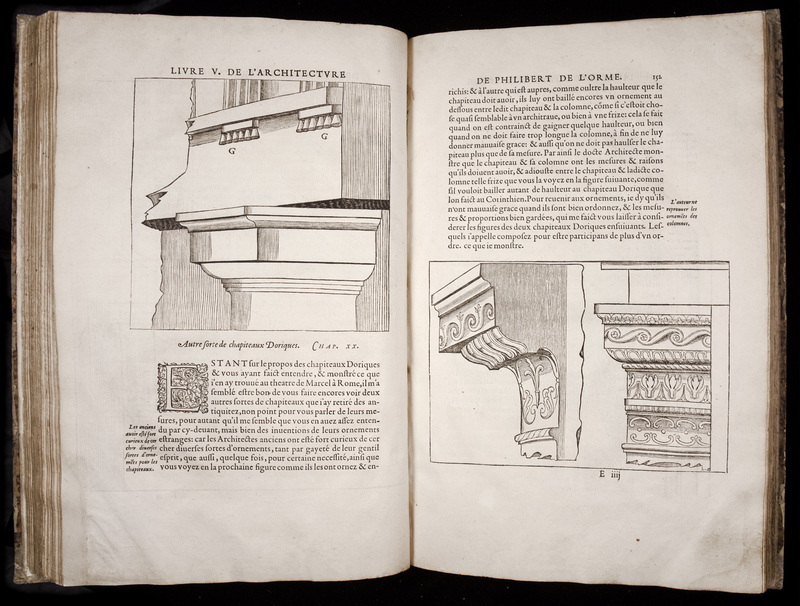 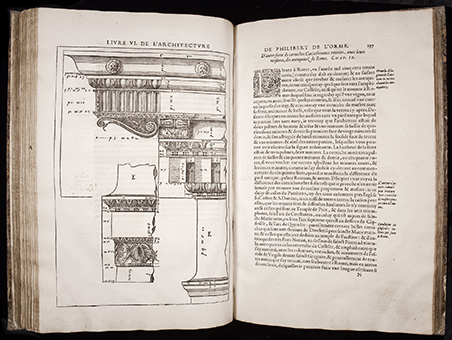 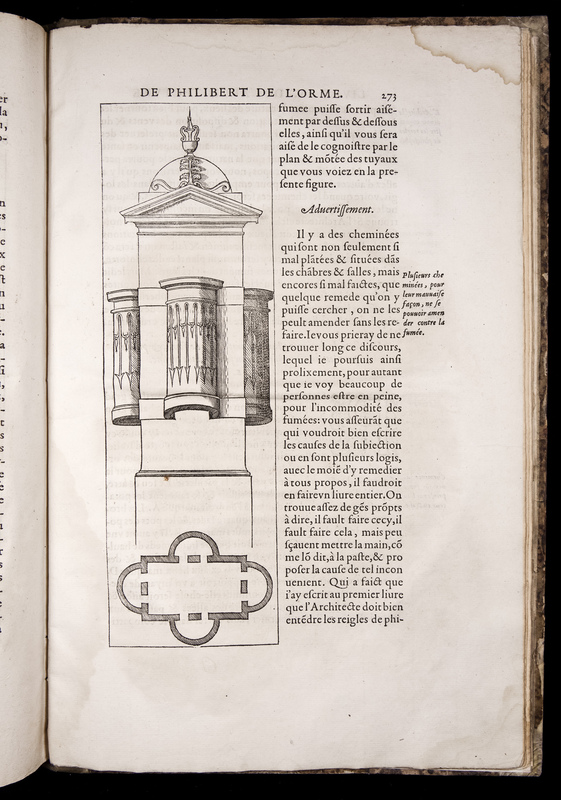 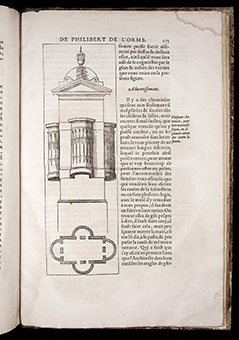 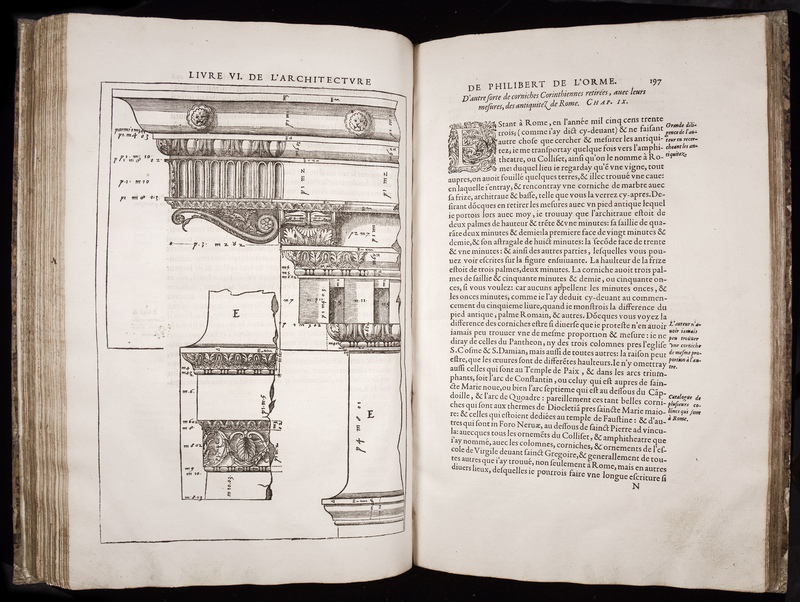 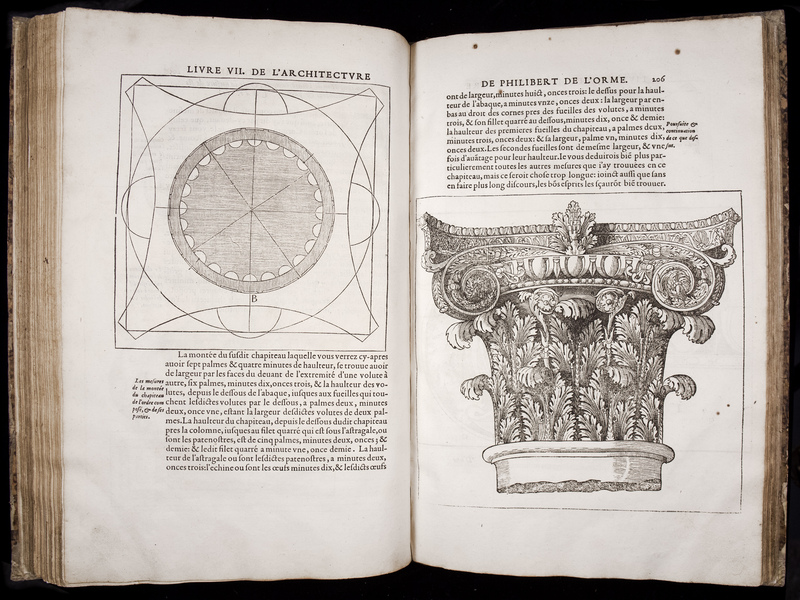 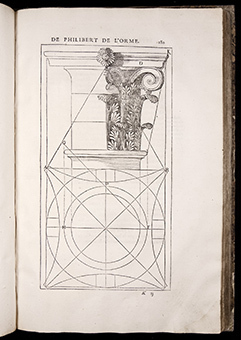 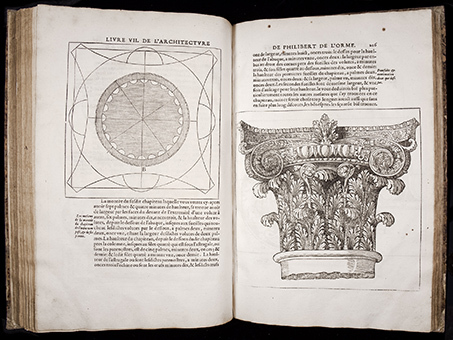 Book V addresses decoration with the Tuscan, Doric and Ionic orders. 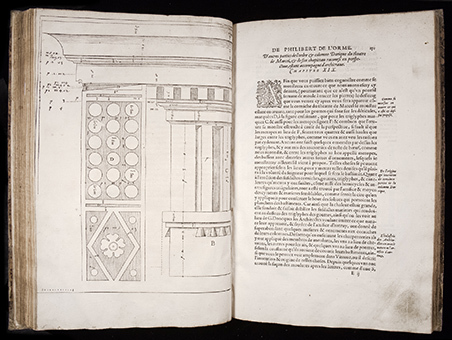 Book VI is entirely devoted to the Corinthian order, and book VII treats various ways to "composer" original orders as well as the problem, also very important, of the French order. 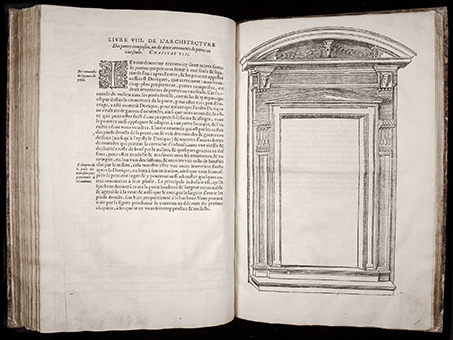 The final books deal with different sorts of openings, doors, windows and dormer windows, along with façade organization, then fireplaces. 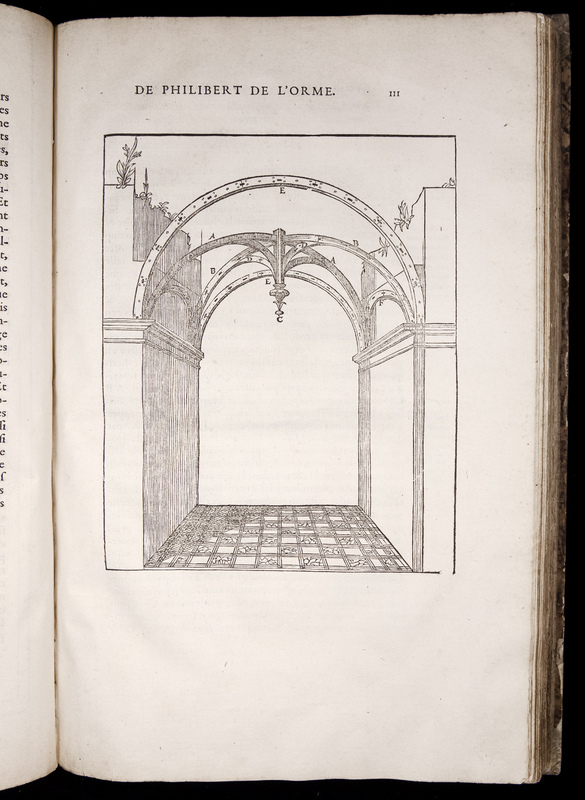 A long conclusion gives the author the occasion to reflect at length on the architect's profession. 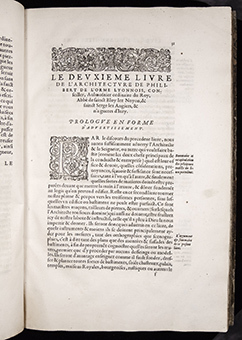 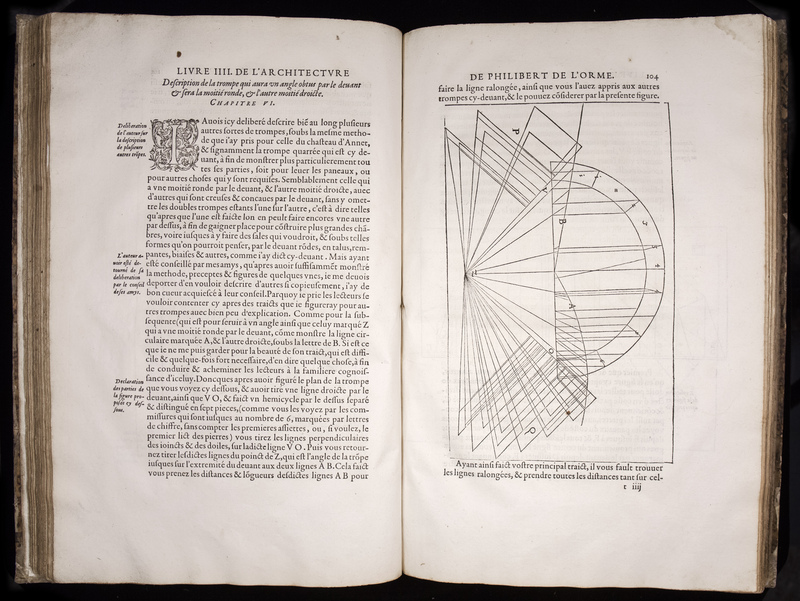 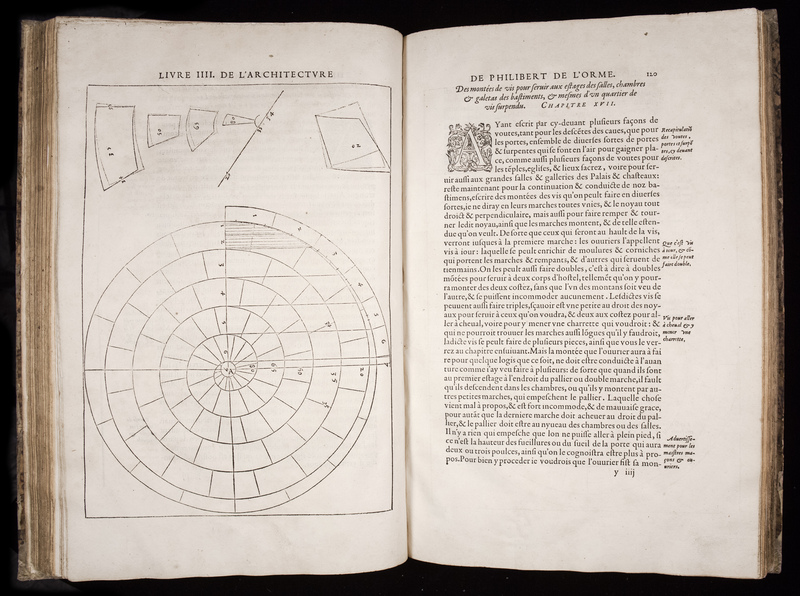 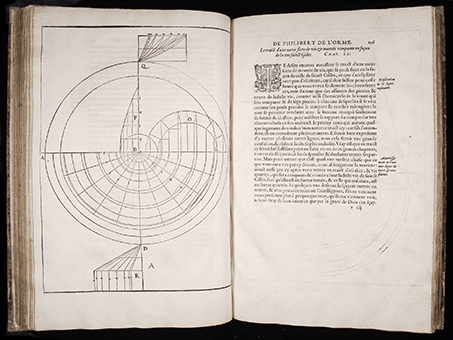 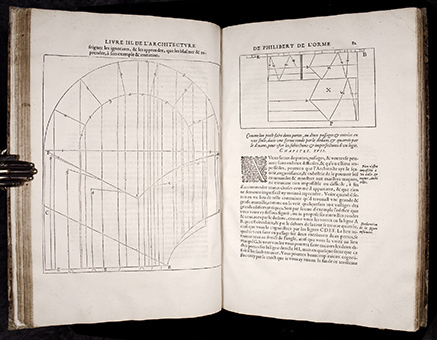 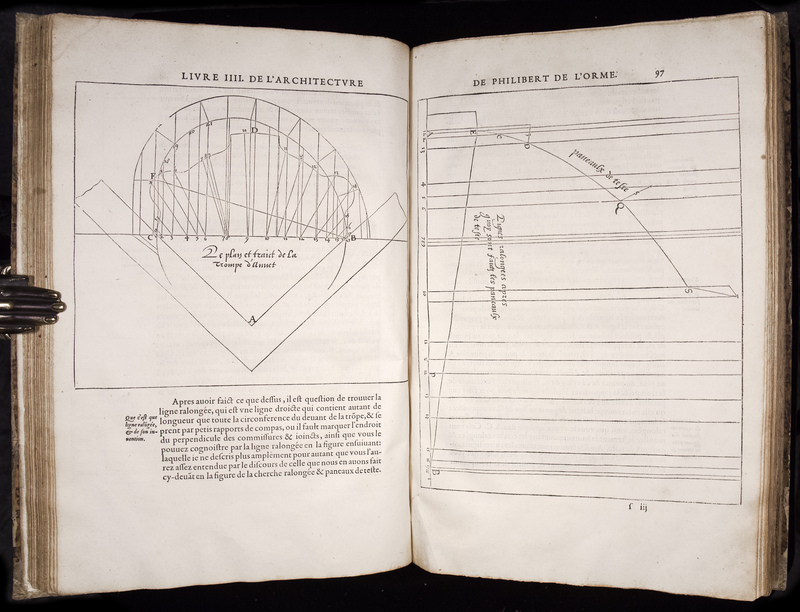 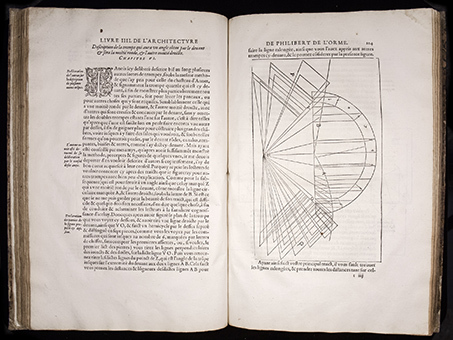 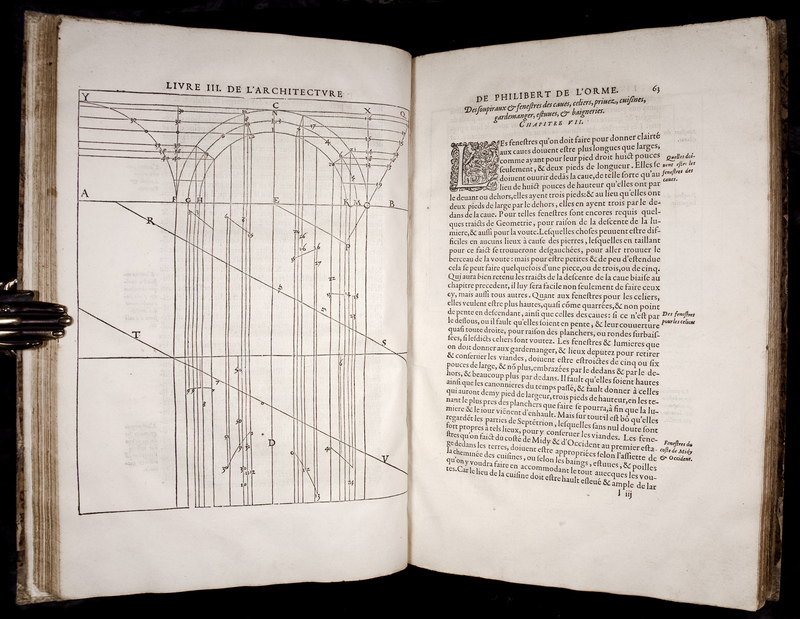 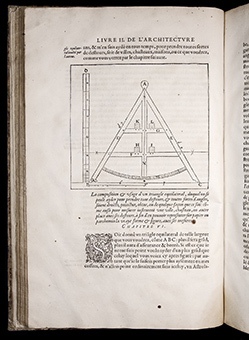 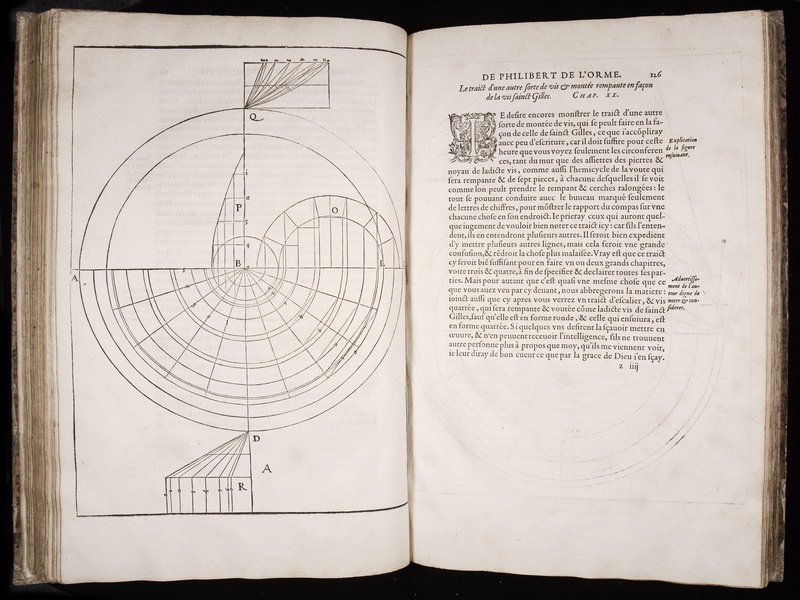 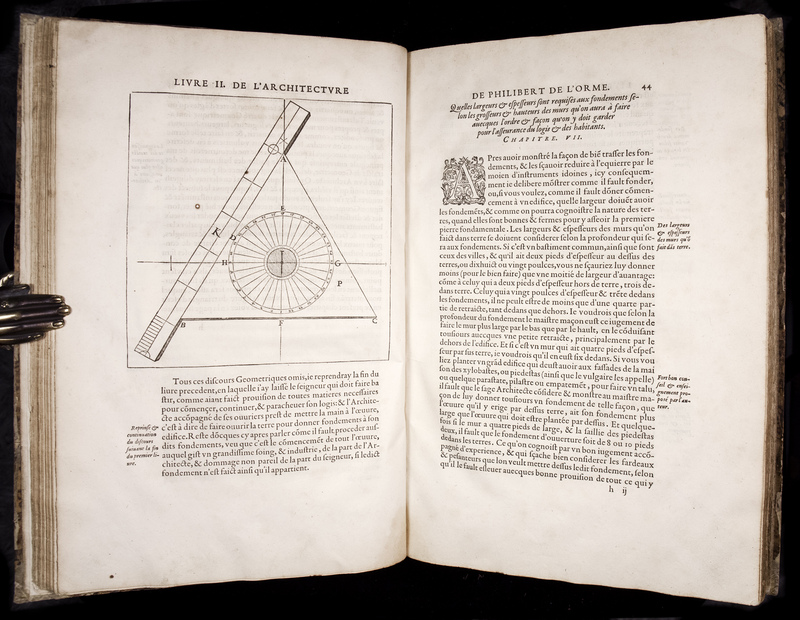 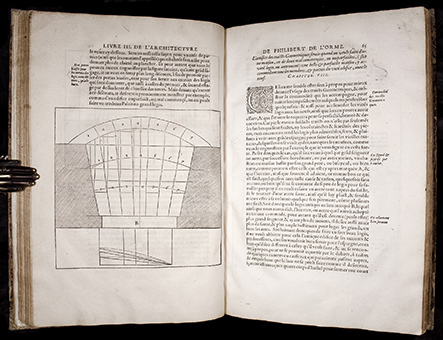 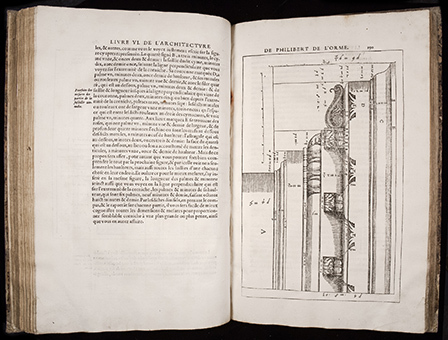 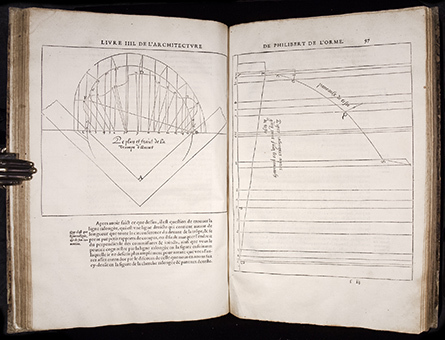 "De l'Orme did not have the time to write the Second tome he promised several times, in which he would have presented his own works and put forth his doctrine of the "Divines proportions". 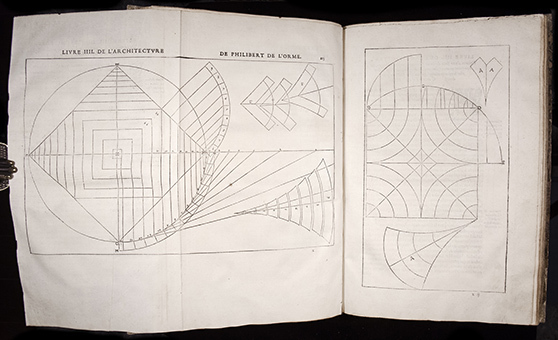 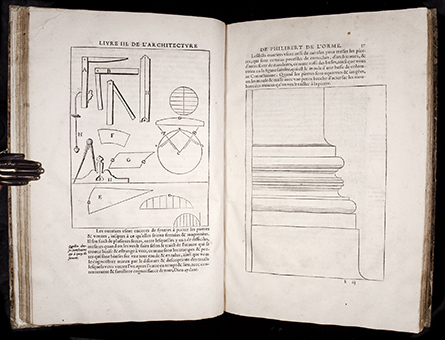 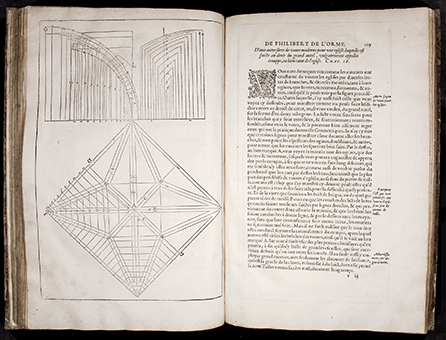 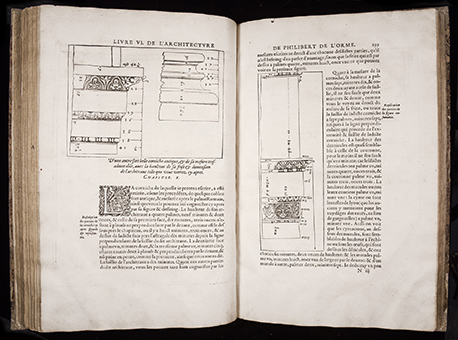 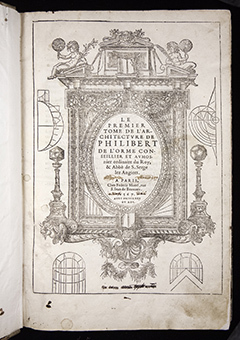 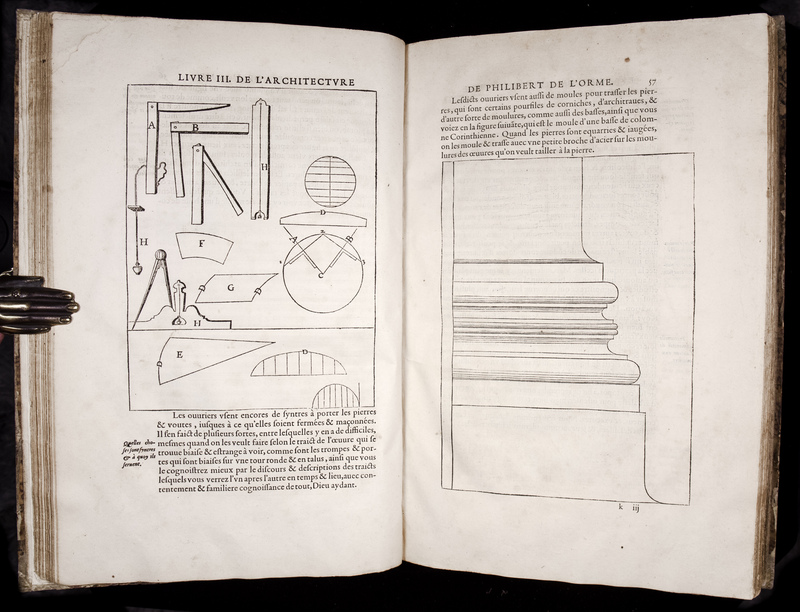 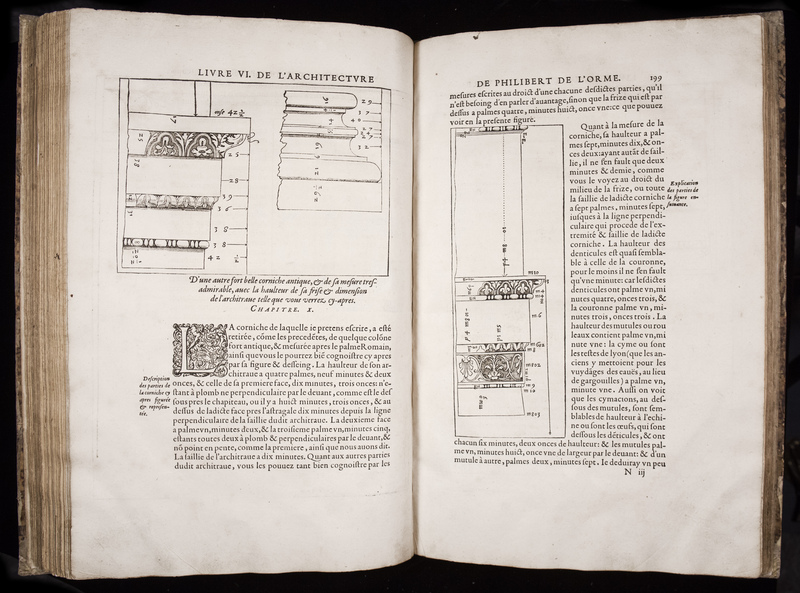 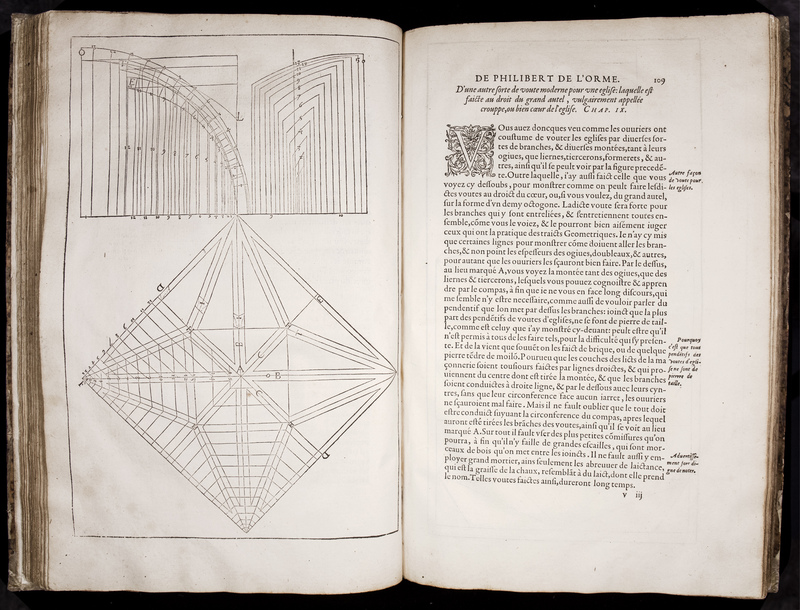 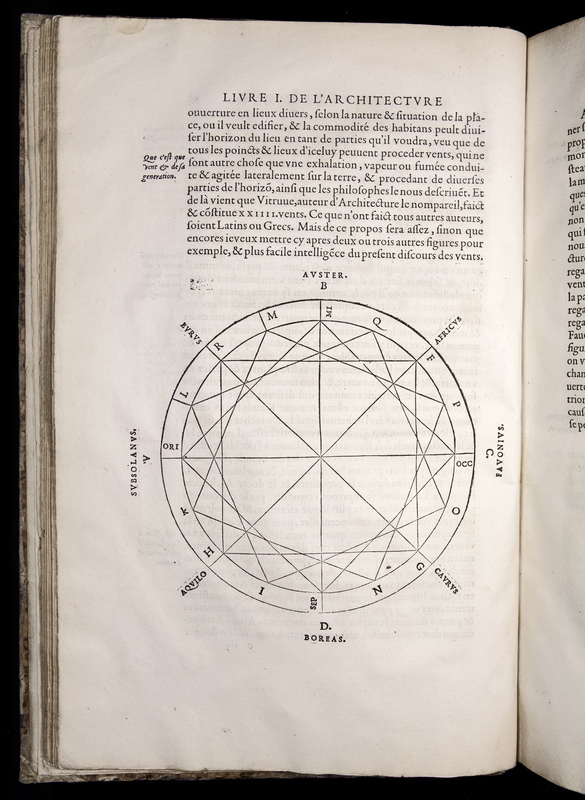 No doubt aware that he would not have the time to carry his work through to a successful conclusion, Philibert tried to integrate the planned-for material in the last books of the Premier tome, which makes its structure rather confused sometimes. 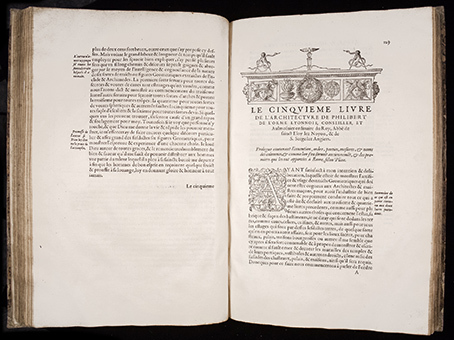 The book is dedicated to Catherine de' Medici (1519 - 1589), who at the time of the publication of De l'Orme's book was the powerful regent of France, and mother of the current King Charles IX, and before had been Queen consort of France as the wife of King Henry II from 1547 to 1559. Royal Folio; text block measures 39 cm x 24.5 cm; very large example (Harvard copy described by Mortimer is 37.1 cm tall; Vershbow copy measures 38.1 cm). 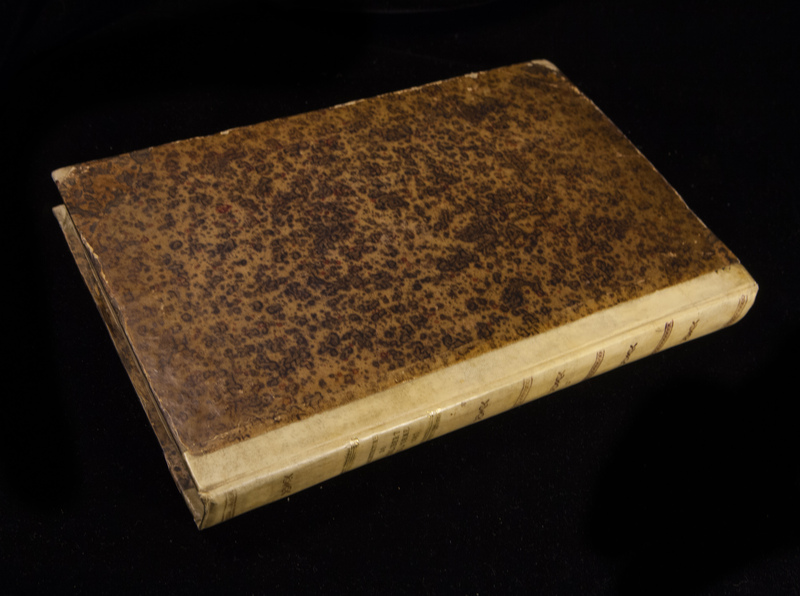 Bound in 19th-century 1/4-vellum over marbled boards. 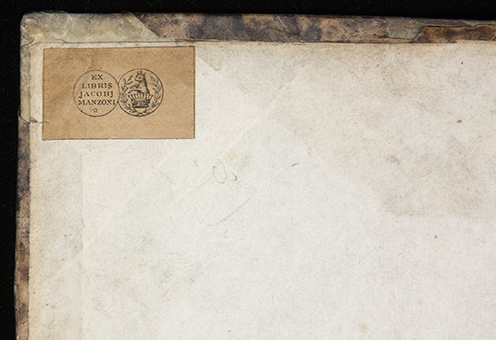 Flat spine decorated and lettered in gilt. 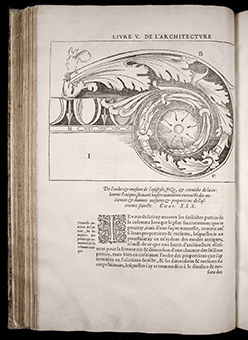 Edges gilt. 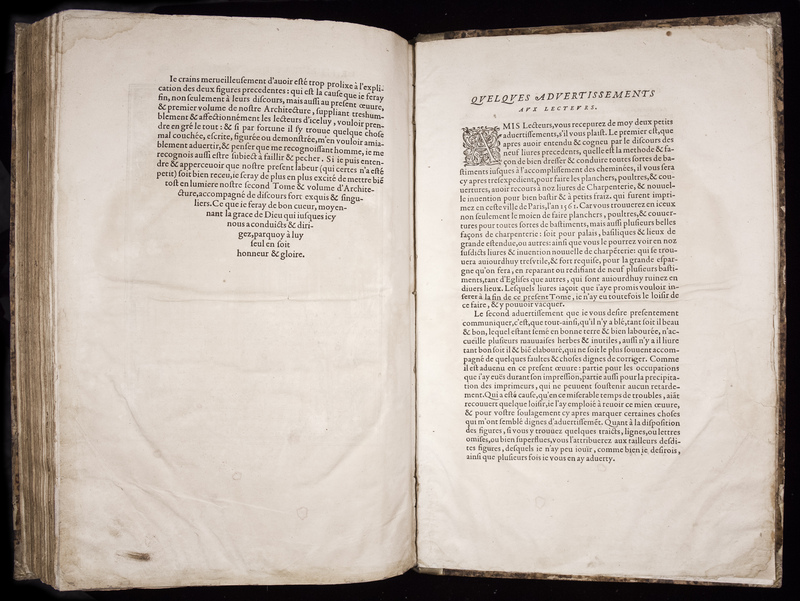 Foliation: , 283 [i.e. 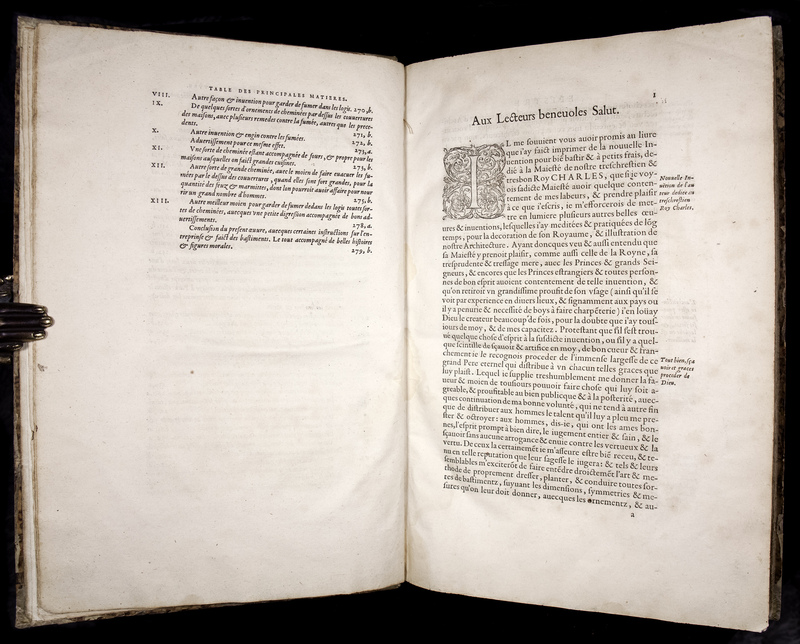 282],  leaves (including 5 folded double-leaves, counted as single). 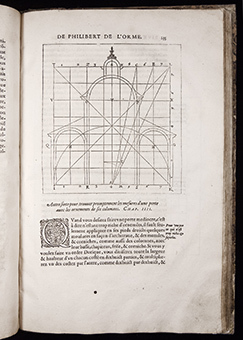 Signatures: ã4 ê6 [-ê6 blank] a-n6 o4 p2 q6 r4 s-v6 x4 y-z6 A-C6 D2 E-M6 N4 O-V6 X5 Y6 Z4 Aaa6 Bbb4 Ccc-Eee6. 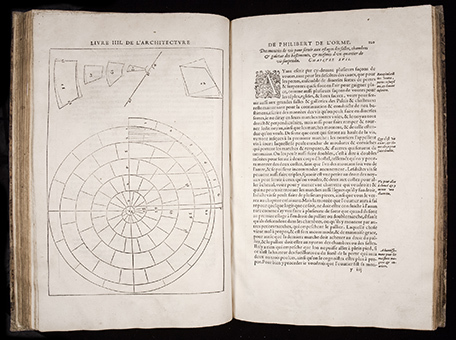 Collated and COMPLETE. 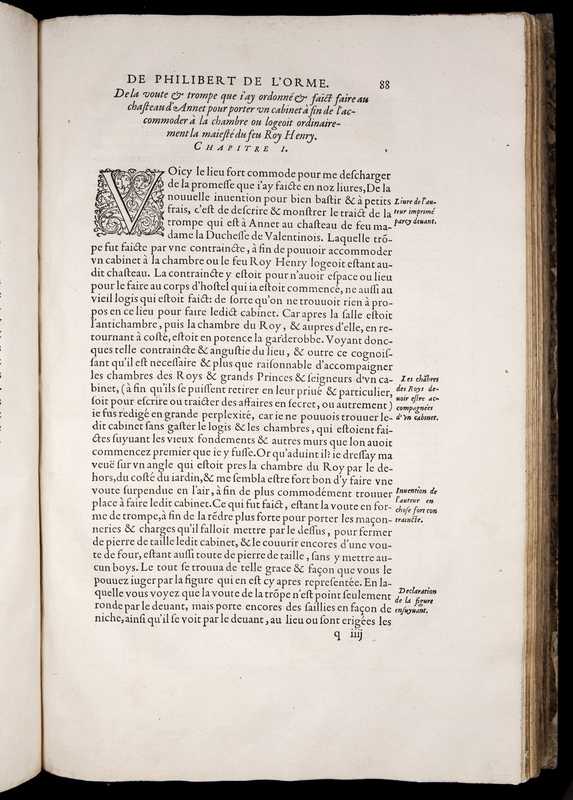 Without the blank ê6 (as usual), but including the two unnumbered leaves at the end: Eee4 with "Quelques advertissements aux lecteurs" on recto and errata on verso, and Eee5 with a second privilege statement on recto (verso blank). 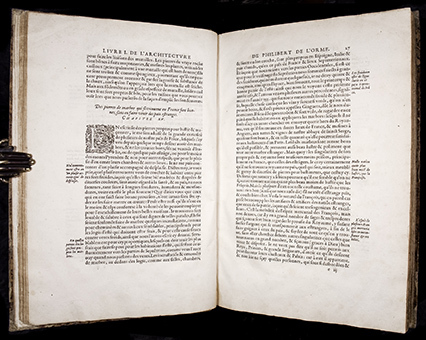 Eee4 and Eee5 are rarely present (the Harvard copy described by Mortimer, as well as the Vershbow copy sold at Christie's, NY, April 2013 for $35,000, both lack these leaves). 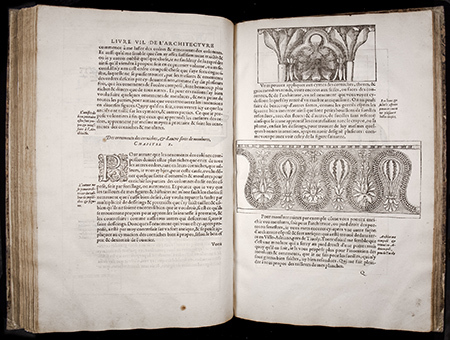 Five leaves (x1,3, X1 and Bbb1,2) are folding double leaves (though counted as singles in foliation); also, leaf I4 slightly taller than the rest of the textblock (to accommodate a tall column woodcut) with about 2 cm section at top folded in. 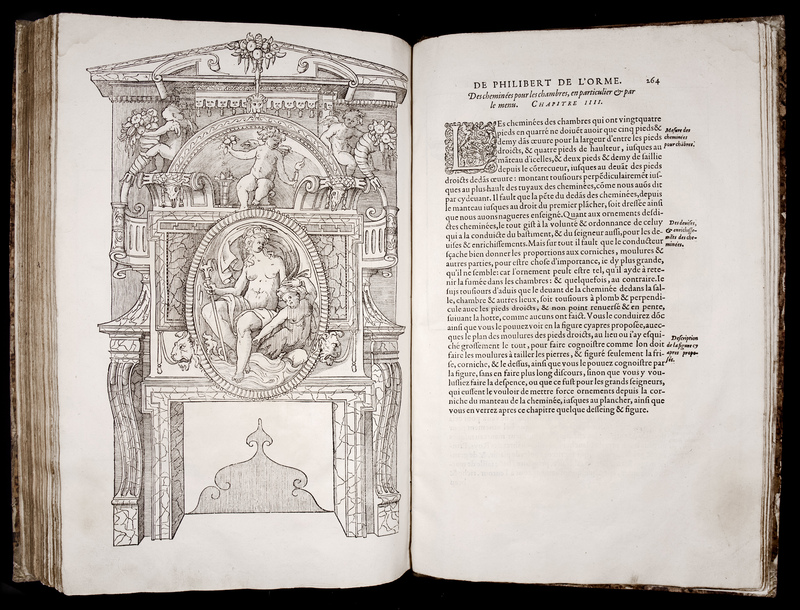 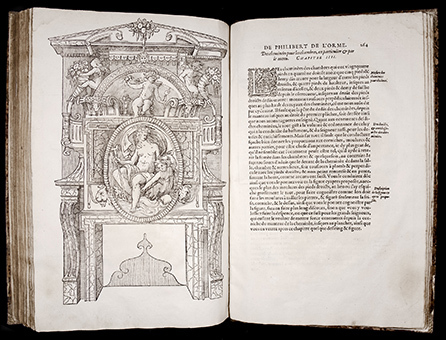 Title page within magnificent architectural allegorical woodcut border in the form of a tablet with a broken pediment and cherubs above, with four geometrical diagrams at corners and four further diagrams printed outside the border. 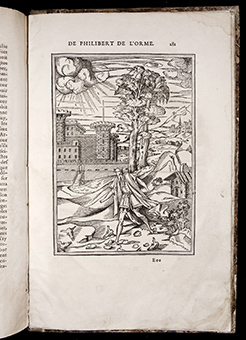 Illustrated with 205 fine large woodcut illustrations, of which 74 are full-page and 7 are double-page blocks. 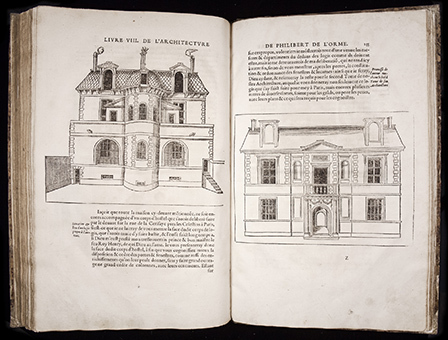 Allegorical full-page illustrations of the good and bad architects on Eee1r and Eee3r. 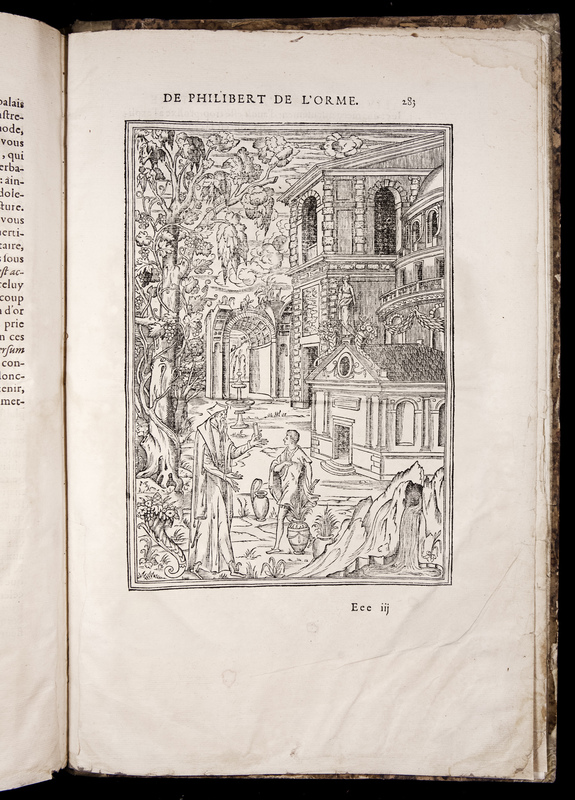 Superb large woodcut head-pieces and large decorative (floriated and grotesque) woodcut initials. 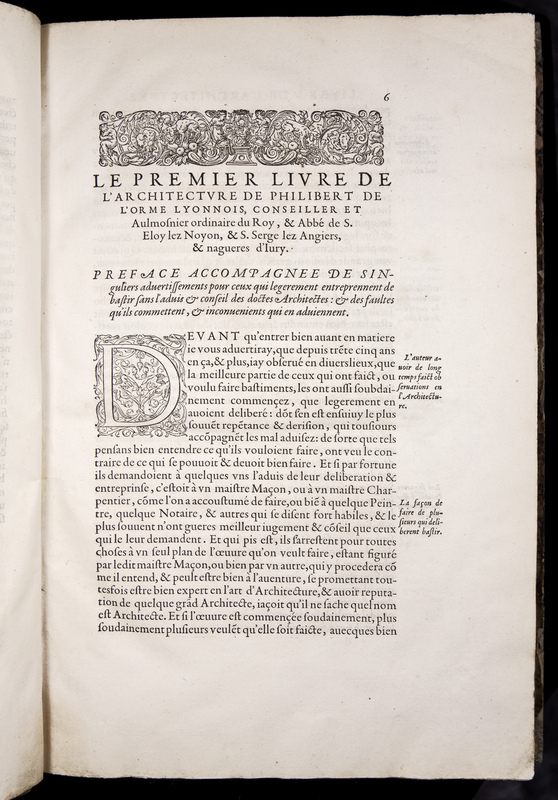 Preliminaries Include Royal privilege statement on verso of title, author's dedication to Catherine de' Medici (leaves ã2r-4v) and a table of contents (ê1r-5v), which is followed by author's preface to the reader (a1r-5v). 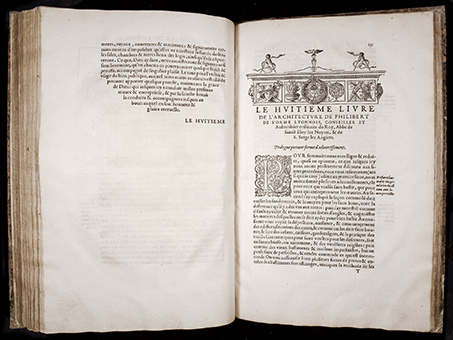 Mortimer French 355; Brunet, Supple. 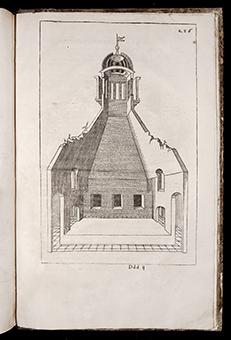 I, 888-9; Fowler Architect. coll. 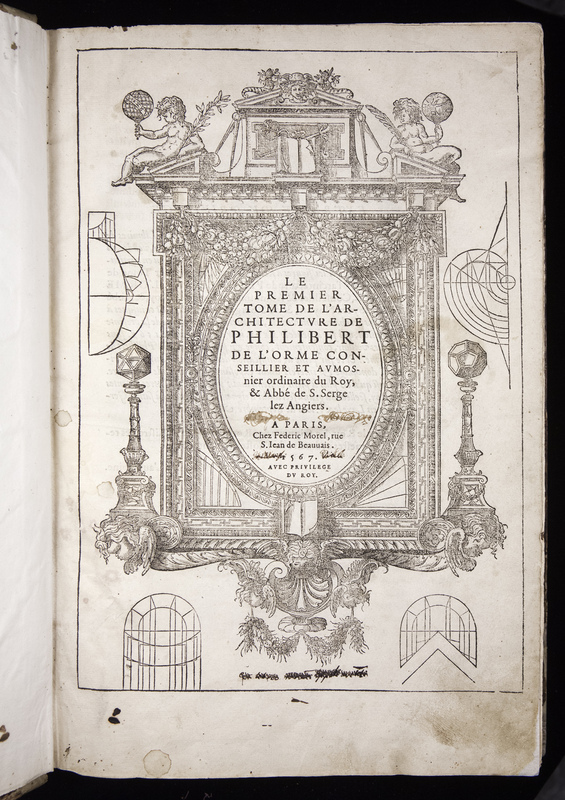 99; Clouzot, Philibert de l'Orme, pp. 90-107; Berliner Ornamentstichkatalog 2362; Pettegree, French Vernacular Books 15434; cf. 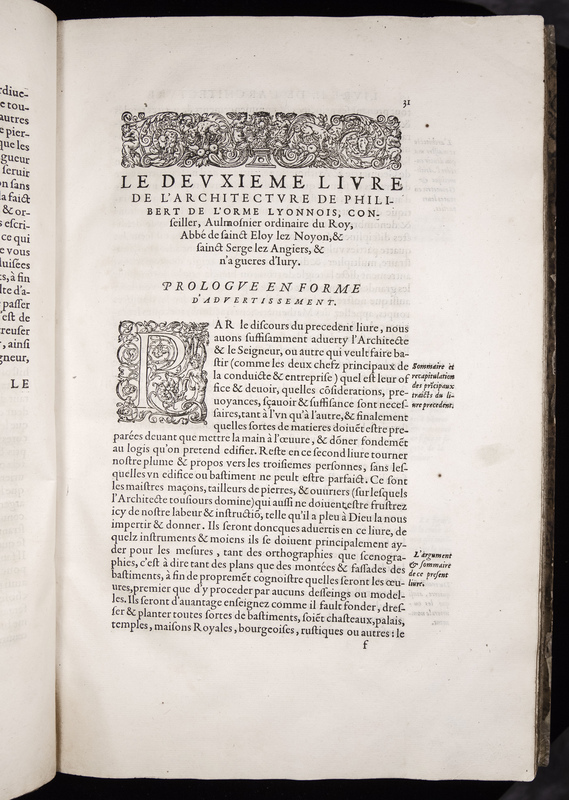 Adams L 1513 and Millard French I, 105 (citing 1568 2nd issue). 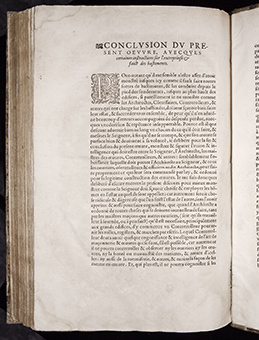 Manuscript acquisition note (to bottom margin of Eee4v) in French by marquis Pierfrancesco Palmucci [de Pellicani], dated 1740. 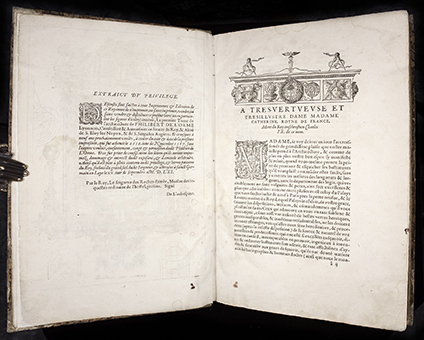 Palmucci was an 18th-century Italian aristocrat, jurist and antiquarian from Macerata (in Marche region), who superintended the publication of an essay on medieval bronzes "Delle Tessere cavalleresche di bronzo tenute al collo" (Florence, 1760). Very Good antiquarian condition. Binding rubbed with some wear to extremities. 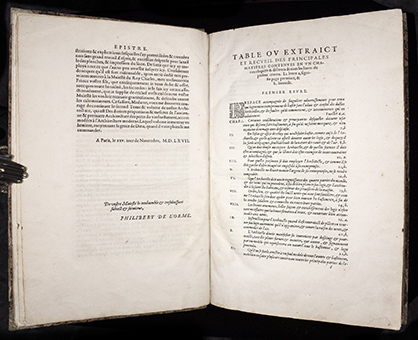 Complete, with 2 additional unnumbered leaves (Eee4,5) at the end present, though second privilege (Eee5) trimmed close to text and laid down on the final blank Eee6 (without loss). 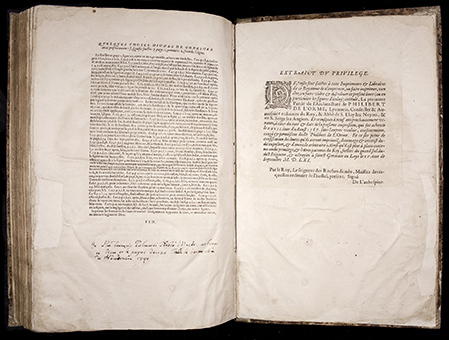 A few leaves with some early manuscript marginalia; title-page with a couple of early ownership signatures inked out, An 18th-century ownership inscription to bottom margin of the errata page (Eee4v). 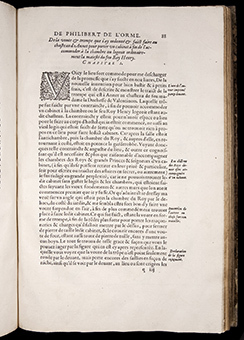 Occasional light browning and some soiling (mainly marginal), a few minor ink-smudges. 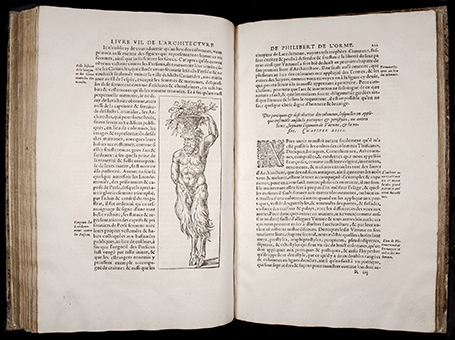 Some leaves slightly browned; a few with light marginal damp-staining. 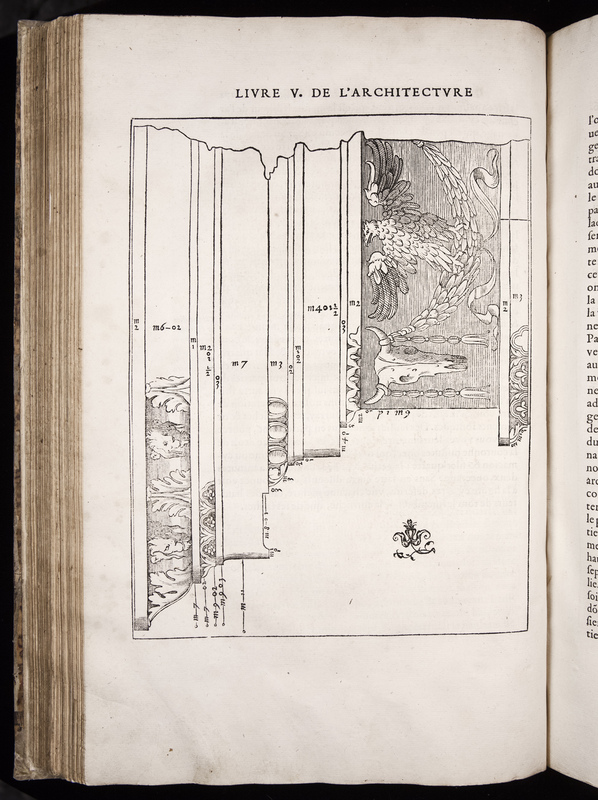 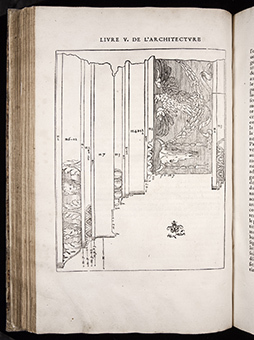 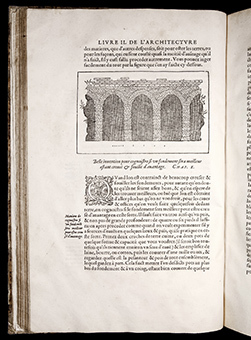 Several marginal repairs (not affecting text), mostly very minor; leaf O3 with a tear slightly affecting the bottom of woodcut on verso, but without loss, repaired in blank portion of recto. 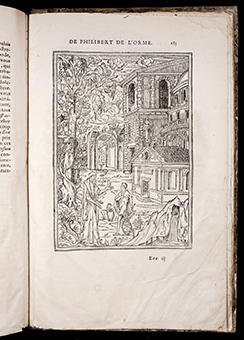 In all, a nice, genuine example of this rare work, exceptionally tall with very wide margins, and with fine provenance.